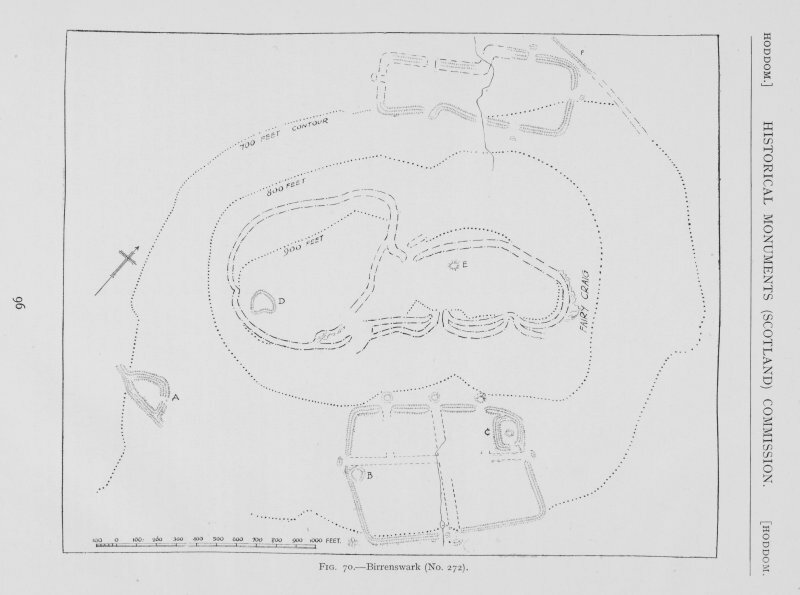 Plan of Burnswark Roman Fort and seige earthworks from Alexander Gordon's 'Itinerarium septentrionale'. 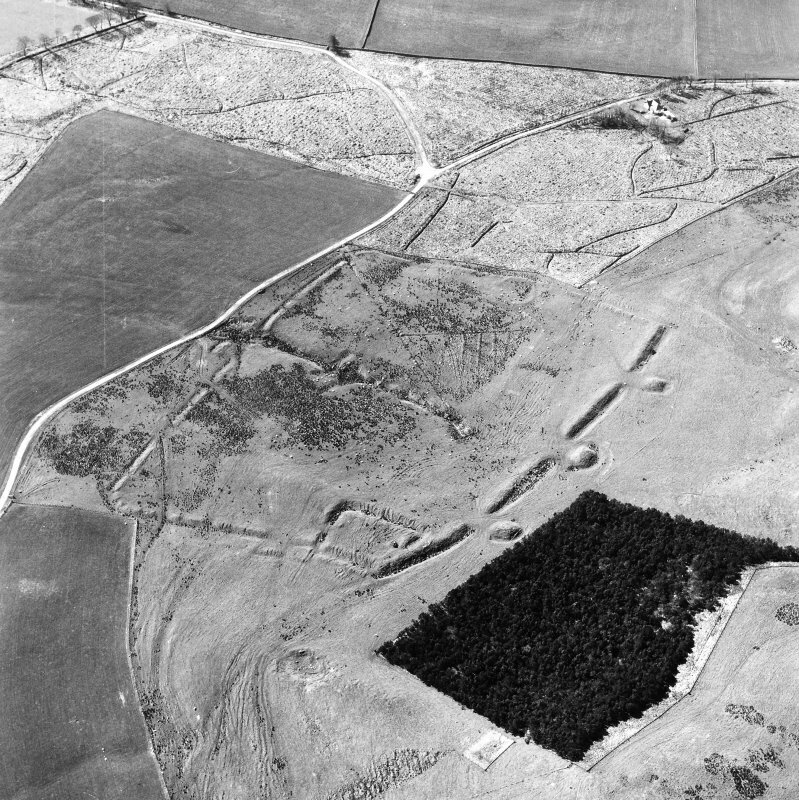 Oblique aerial view of Burnswark Roman Fort, siegeworks and other sites. 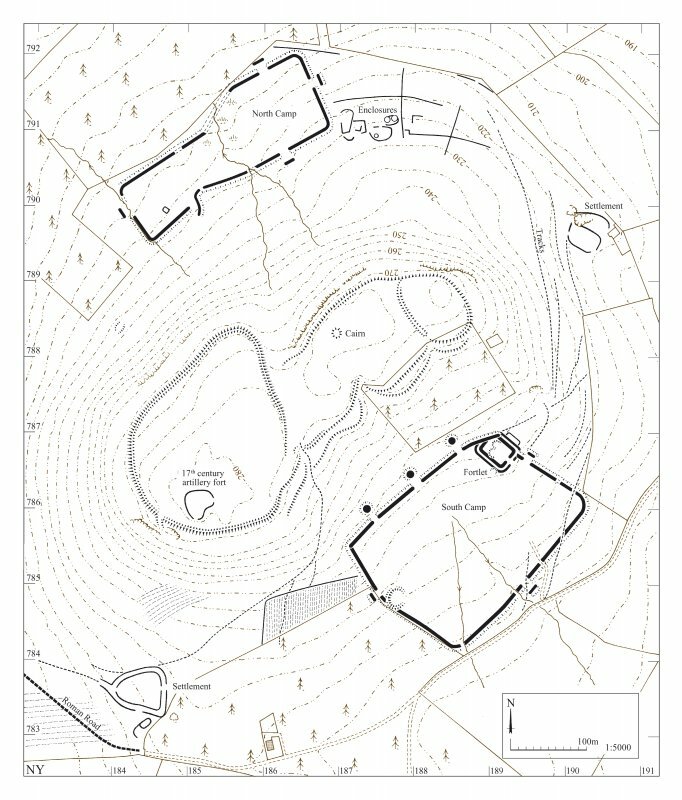 Map of the earthworks in the landscape around Burnswark: publication drawing for Inventory of Eastern Dumfriesshire, generated from computer file 5BURNSW.PM6. Unattributed, . Plan showing fortifications. Titled: 'Birrenswark'. 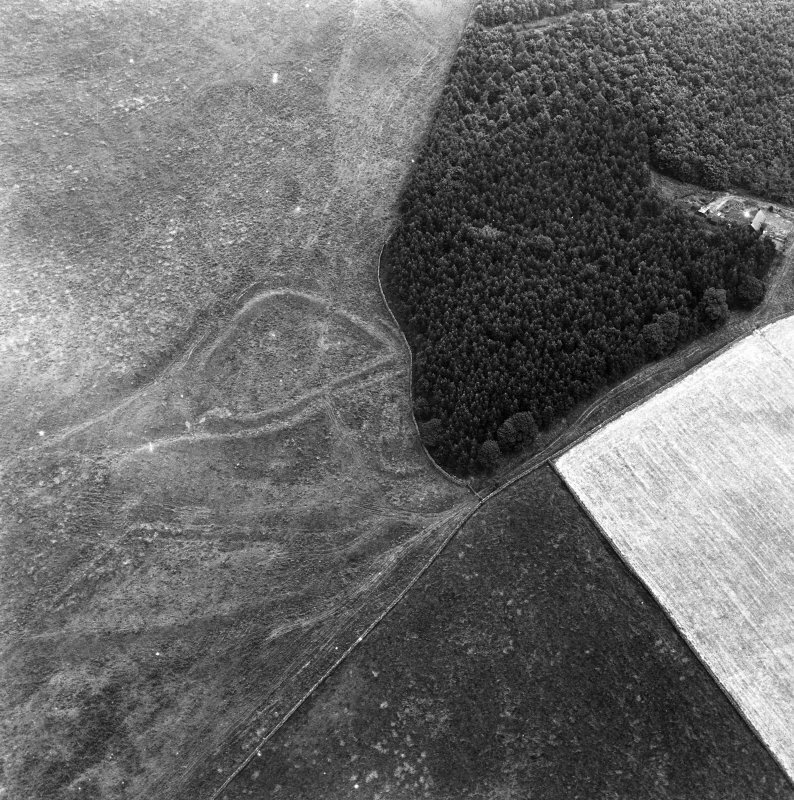 Oblique aerial view of Burnswark Roman Fort, seigeworks and other features. 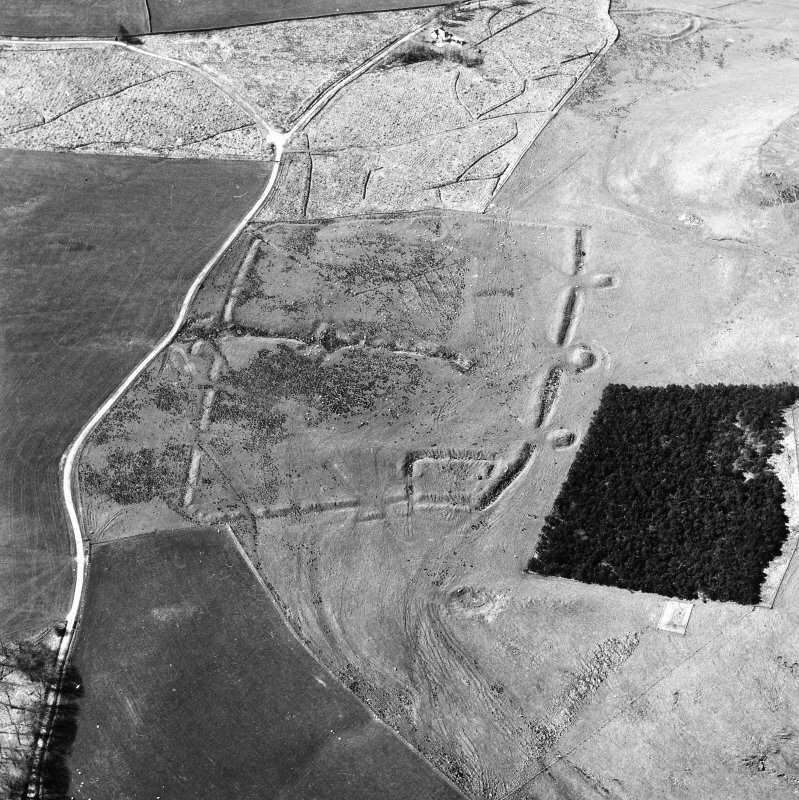 For battle site of 'Brunanburgh' (which has been identified with Burnswark), see NY17NE 25. For quarry and track on Burnswark Hill (at NY17NE 45), see NY 1895 7875. 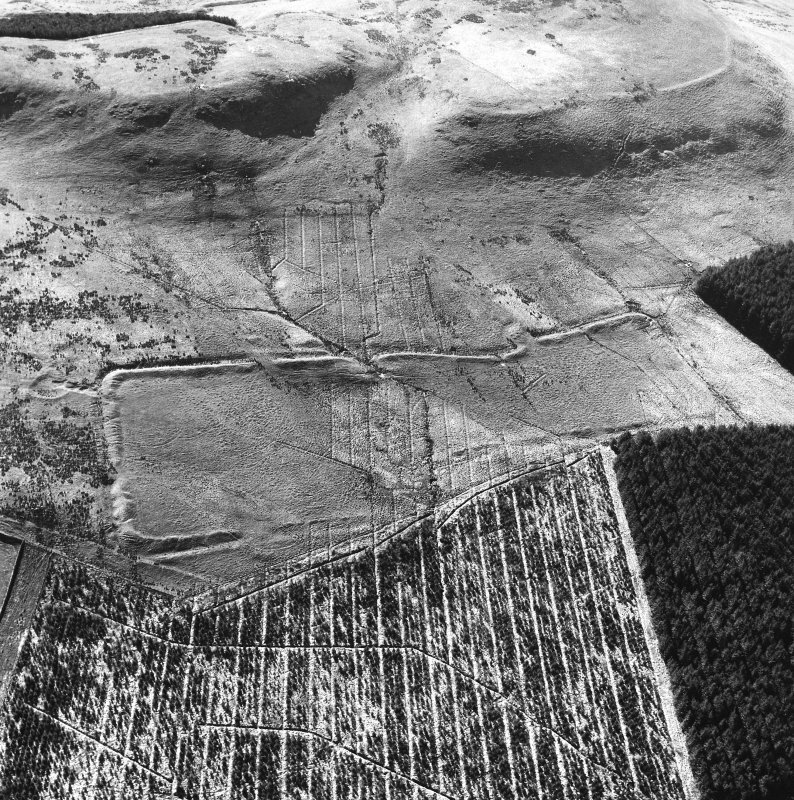 For rig on slopes of Burnswark Hill, see NY17NE 44 (centred NY 1834 7831), NY17NE 46 (centred NY 1847 7847) and NY17NE 47 (centred NY 1866 7847). 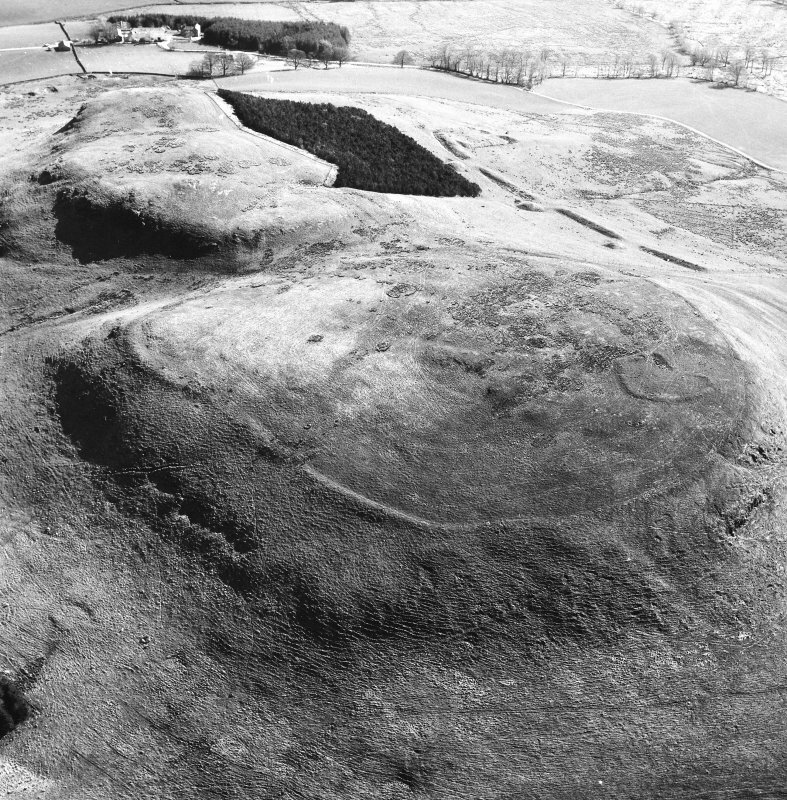 This fort, suggested as the oppidum for the Novantae, is situated on the summit of Burnswark Hill, which also has a small Roman siege camp on its NW and SE flanks, and a 2nd century Roman fortlet in the corner of the SE camp; and a cairn on its highest point. 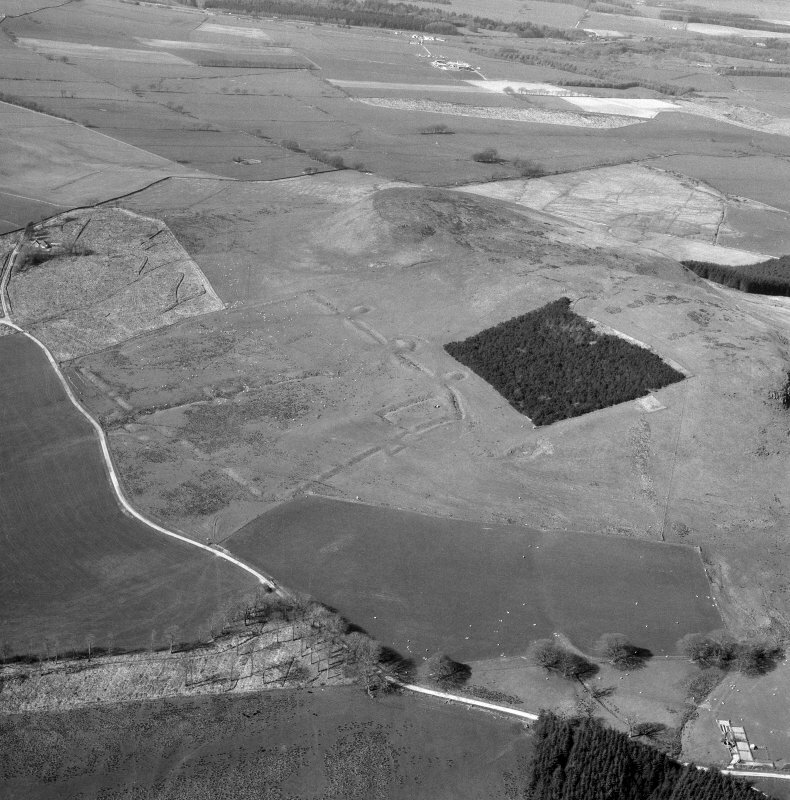 The fortlet predates the siege camps, the former dateable to c.140 AD, so it may be assumed that the latter were used in a punitive expedition in 155 AD after Birrens (NY27NW 4) was destroyed. Occupation of the fort ceased after the siege. 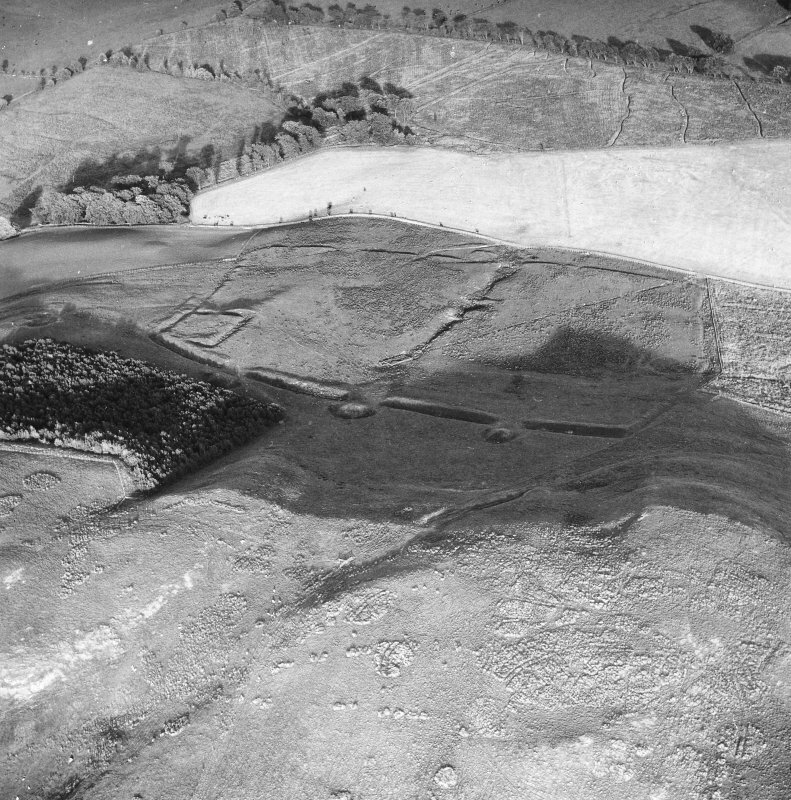 Excavations were carried out here in 1898, fully described by D Christison, J Barbour and J Anderson (1899) and also in 1966-8. The fort has developed from an oval enclosure, c 900' by 650', to an irregularly shaped defended area 1650' long, and 17 acres in extent. 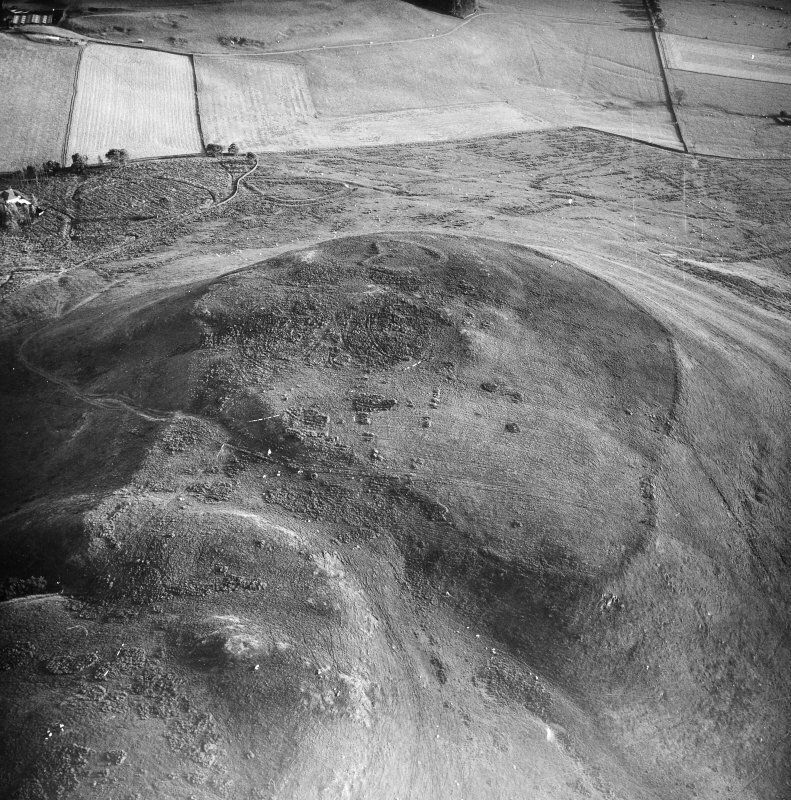 The cairn is situated on the summit of the middle part of the plateau and is c.10' high; when excavated in 1898, showed its cist had been destroyed, only one stone remaining in position, and fragments of charred bone were also found. The enclosures at NY 1843 7835 and NY 1902 7897 are probably Md homesteads, but though B H St J O'Neil suggests that the work at NY 1850 7860 is of the Civil War, half moon battery type, excavation in 1966 proved inconclusive, finding two phases in its construction, namely a small outer ditch with a turf revetted brash rampart, which, after collapsing, was revetted with heavy stonework. 1st-2nd century RB material was found in the brash mound, presumably scraped up from an earlier occupation. Numerous pits of pre-Roman date and post-holes in the interior require further investigation. 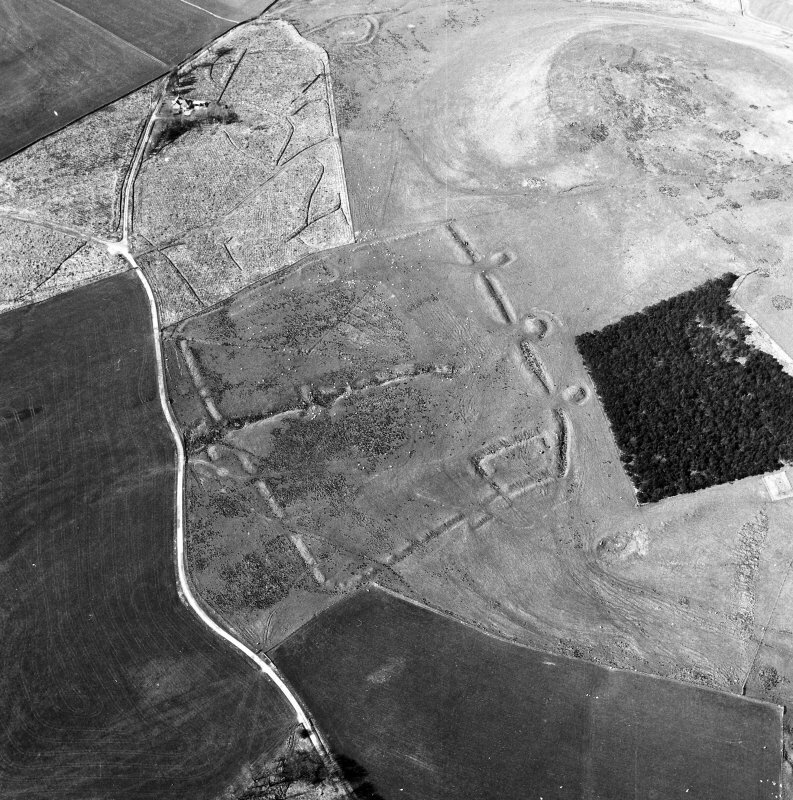 The SE Roman camp measures c. 900' by 670', with three entrances on the N, each guarded by a roughly circular mound c. 60' in diameter at base. Known locally as "The Three Brethren", it is suggested by R G Collingwood (1927) that they were artillery platforms for attacking the fort, though he is unable to cite any parallels. The other sides of the camp have central gateways, guarded by normal traverses. 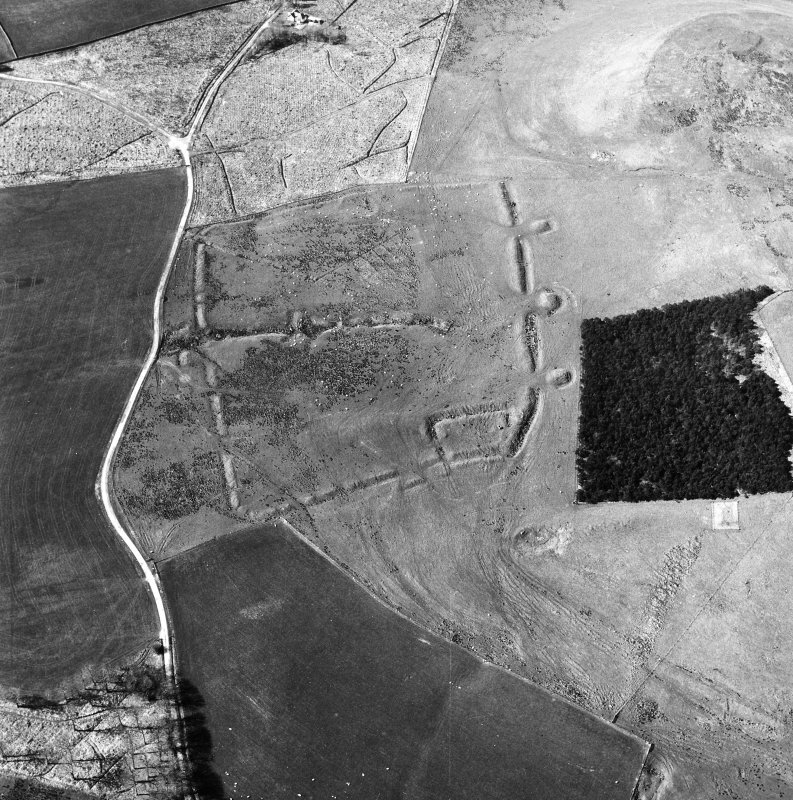 The suggested building remains shown on plan of this camp were shown to be only a stretch of paving, possibly a road, in 1968. The water supply of this camp came from a fine spring, called "Agricola's Well". 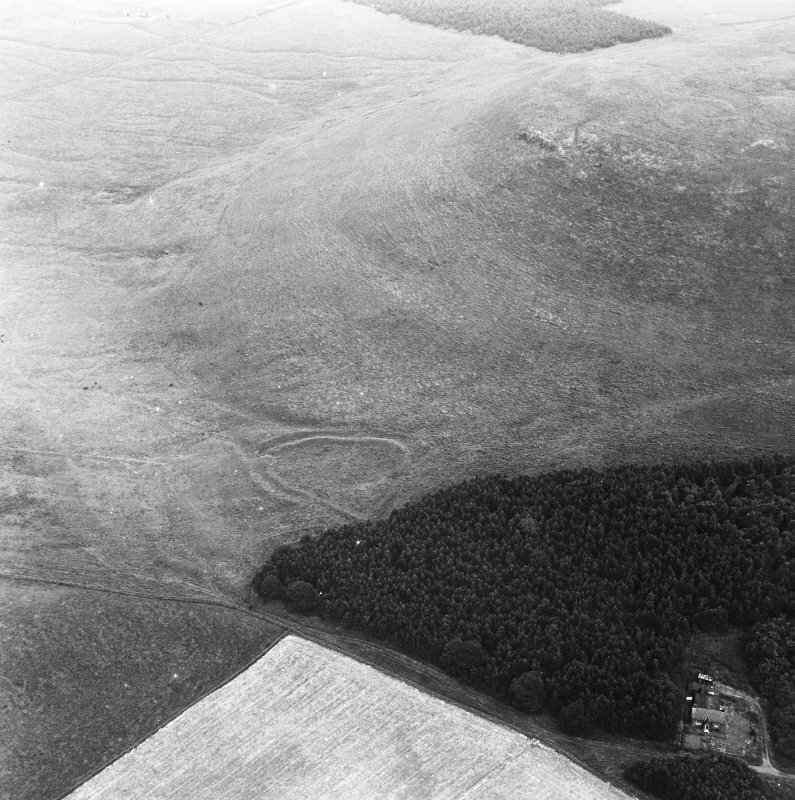 The fortlet, located on the N corner of the SE camp, measures 100' N-S by 70', being defended by a ditch and double rampart. 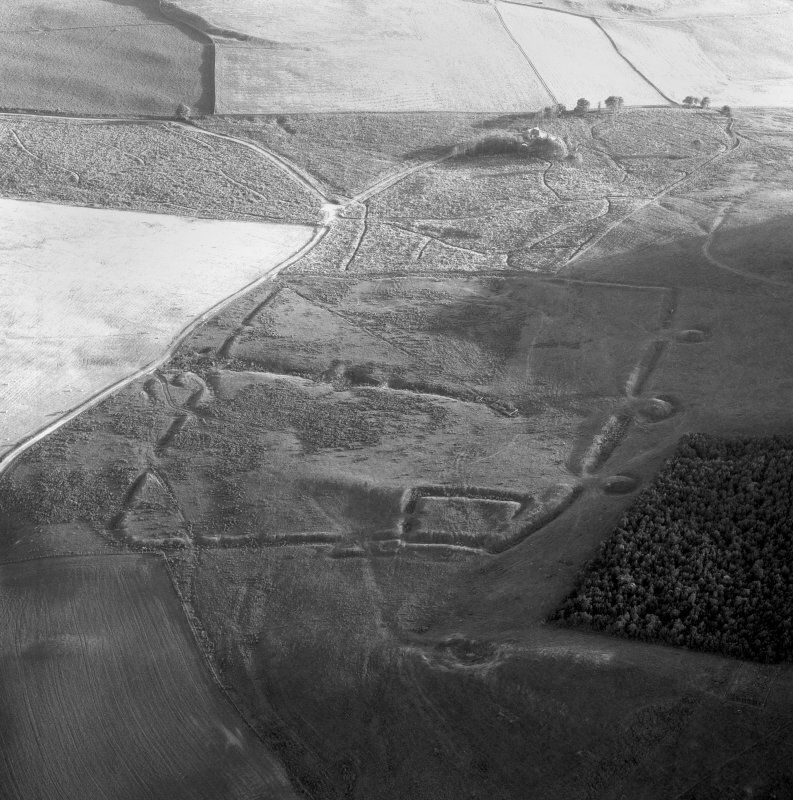 The NW Roman camp measures c. 1,000' by 400', and has six gateways, one in the E and W, and two in the N and S; it is incomplete, but it has the same character as the SE camp. Finds ranging from flint flakes and winged and flanged axes to Roman glass and paste trinkets, iron spearhead, coins (1 Domitian, 1 Nero, 1 Vespasian, and 2 Trajan) potsherds, etc., also quantities of lead glandes of the kind not used after the end of the 1st century AD. They are in the NMAS, Dumfries Museum, Tullie House Museum, Carlisle, and elsewhere. Information from I A Richmond and A L F Rivet 25 July 1953. Visible on APs 540/1540 F21, 0063-5. J G Callander 1925; W F Cormack 1959; 1961; G Macdonald 1918. 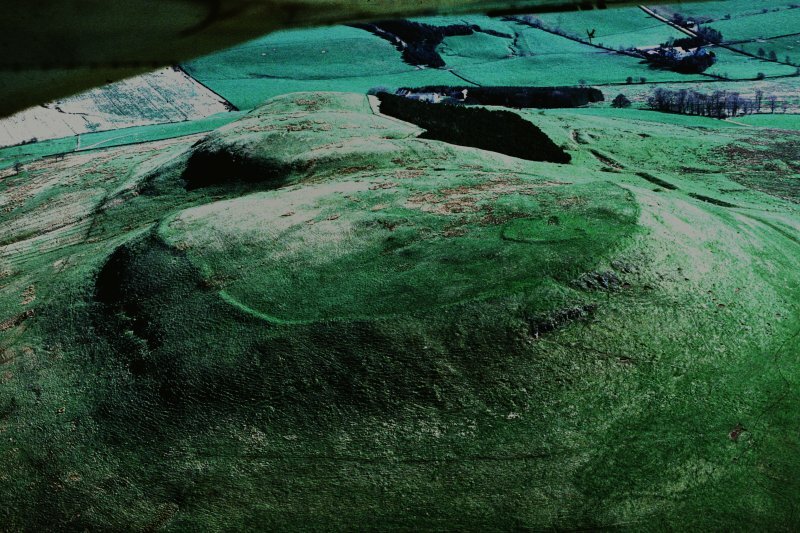 The hill named after the fort is a conspicuous table which dominates most of Annandale and is widely visible. 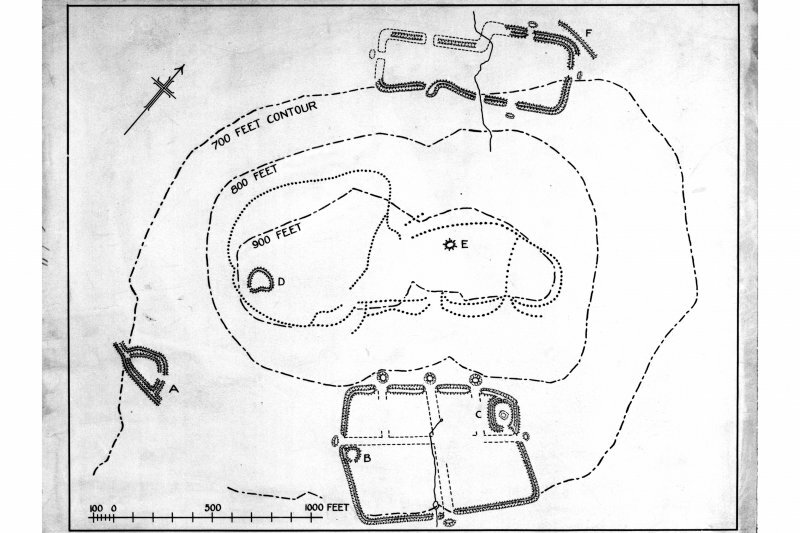 The fort shows a development from an oval enclosure measuring about 900 ft (274m) by 650 ft (198m) to an irregularly-shaped defended area 1650 ft (503m) and 17 acres in extent. Great interest attaches to this place because of the presence of a small Roman siege camp on both the NW and SE flanks of the hill, and of a fortlet dateable to the 2nd century AD, in the corner of the SE camp. 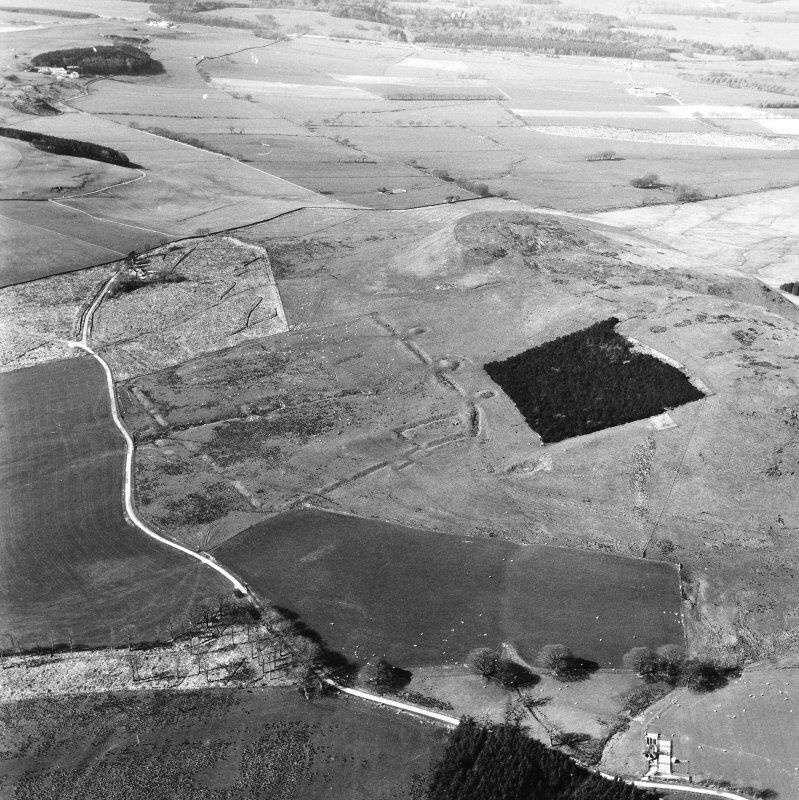 The fortlet predates the siege camps and, as the former can be assigned to the time of the second Roman incursion into the north in about AD 140, it is assumed that the siege camps were used in a punitive expedition after the uprisings of AD 155, when the nearby fort at Birrens was destroyed. 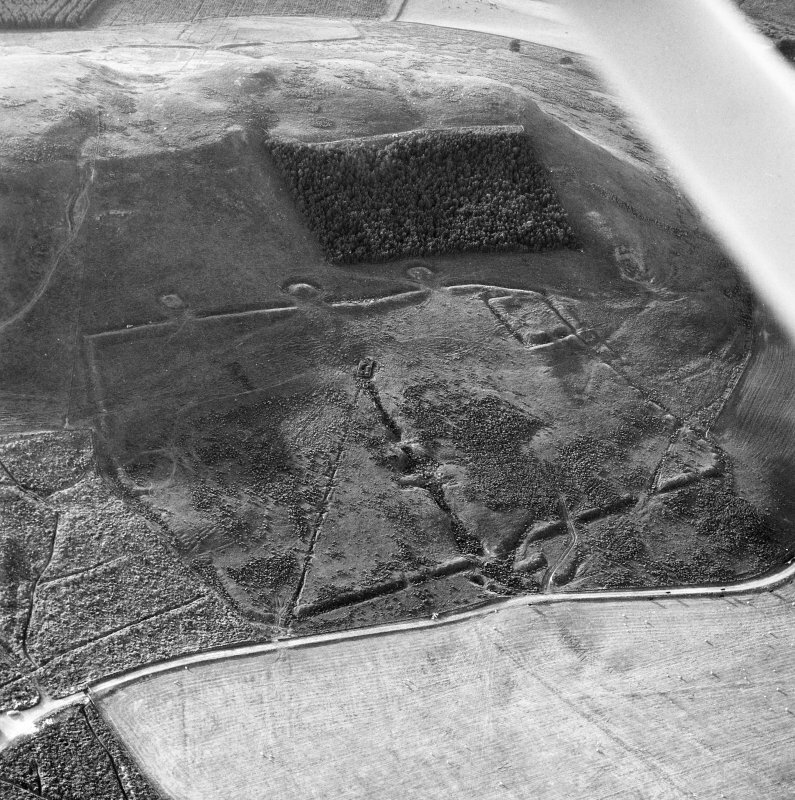 The fort must have been demolished in the 1st century AD, but the presence of the fortlet might suggest that it was still occupied in the first half of the 2nd century. There can be no doubt that occupation ceased after the siege. 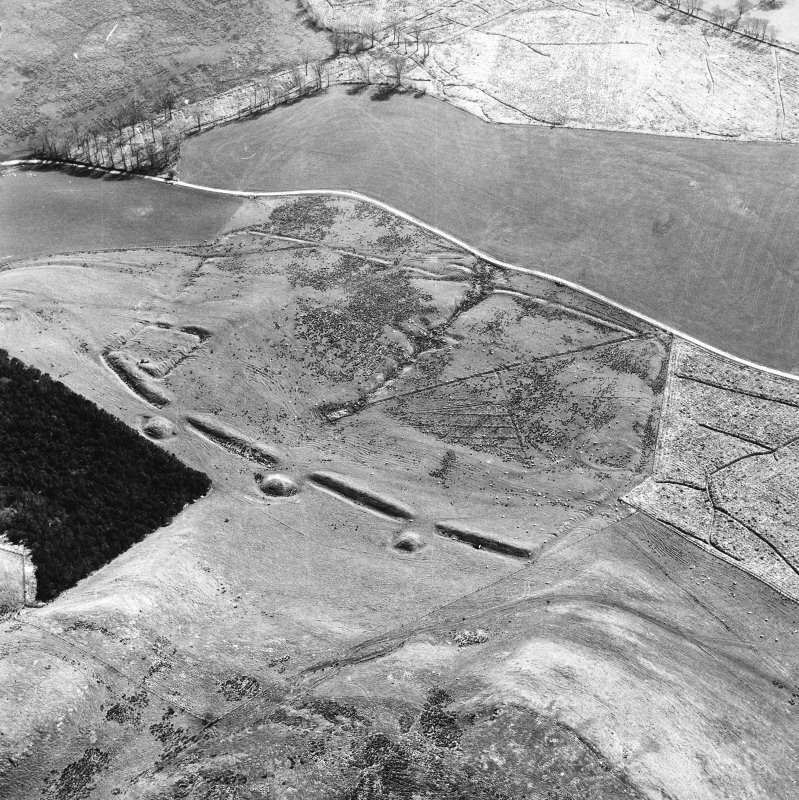 It has been suggested that this fort, in which excavations (in 1966, by Mr G Jobey) disclosed an original palisade dated to the 7th or 6th century BC, might have been the principal centre or oppidum of the Novantae. Surveyed at 1:2500. Numerous finds are in Dumfries Museum. Unlike the picture presented within many other hill-forts of the Border country, hut platforms for timber-built dwellings are not readily visible from ground or air survey at Burnswark. However, recent excavation has shown the presence of superimposed round timber-built round houses in the two internal areas so far examined. 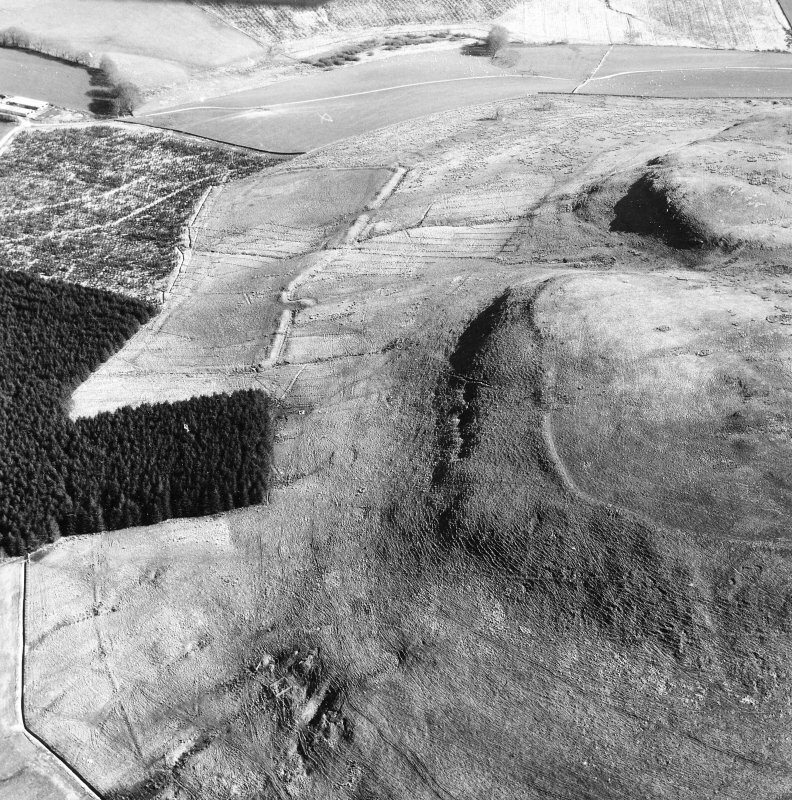 There would seem to be no reason why large areas of the hill-top should not be covered with similar structures and by comparison with the visible pattern at Eildon Hill North or Yeavering Bell in Northumberland, the possibility of over 100 hut sites would not be a fanciful estimate. 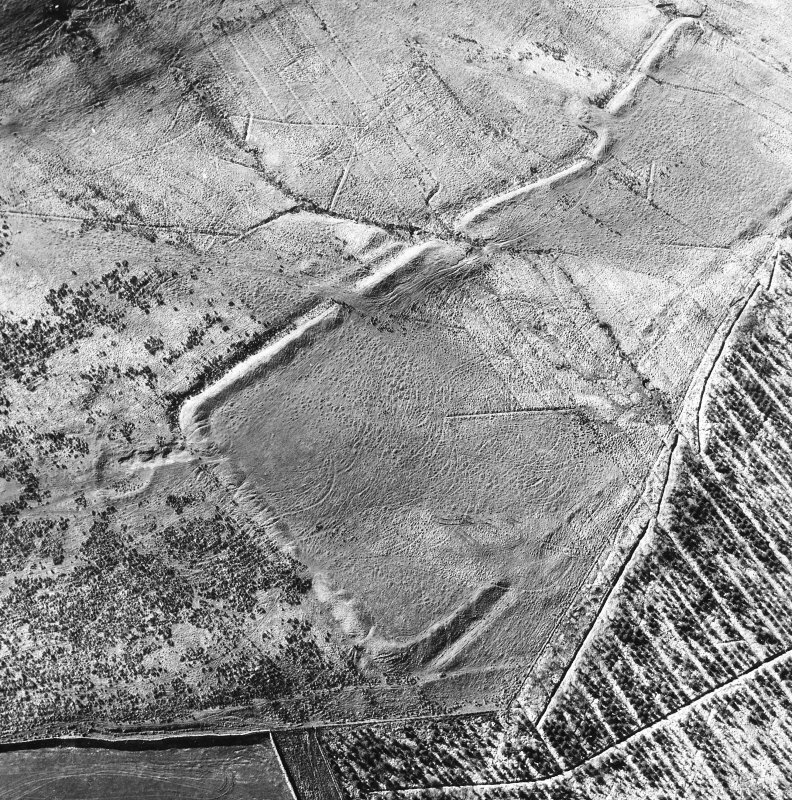 Beneath the rampart of Burnswark fort, recent excavation has revealed twin rows of closely-set post-holes, almost 3m apart, which do not appear to be supports for an earlier rampart but rather for a form of timber stockade which runs for some considerable distance, and may even encircle the whole area enclosed by the later rampart. 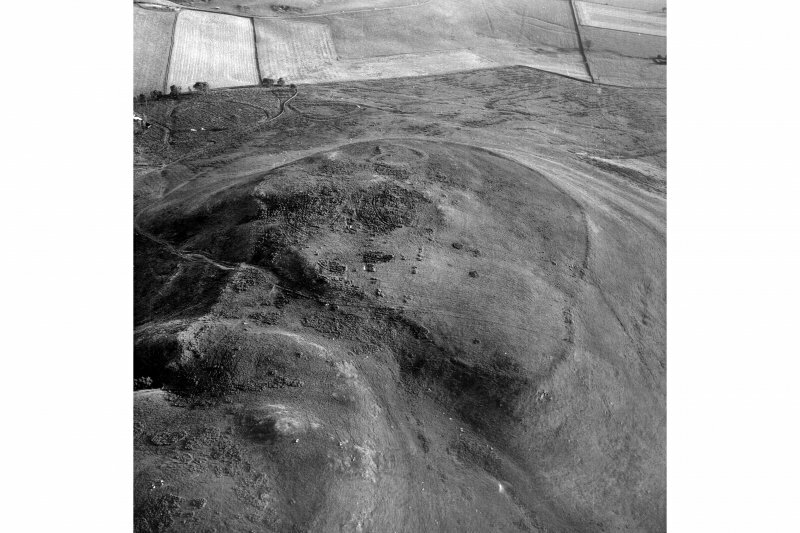 A radiocarbon date of 500 +/- 100 B C for material appropriate to this early phase is in keeping with other 6th - 7th century dates for some palisaded sites in North Britain. Carbonised wood from one of the hill-fort gateways has yielded another radiocarbon date which is not significantly different at 525 +/- 90 B C. It may well be necessary to envisage an earlier date for the initial rampart defences than would have been thought probable some years ago, particularly if these can be shown to follow immediately upon the timber-built phase. The recorded find of a fragment of opaque white glass pendant (H E Kilbride-Jones 1938) from the otherwise unclassifiable scooped enclosure at Burnswark West could be significant as to the possibility of an early date for this site. The gate in the central re-entrant of the south defences of the hill-fort were re-excavated. As at the SW gate,the paved area came late in the sequence, overlying the original rock-cut entrance and timber gate structure. It shows no wear, nor any sign of superstructure. GP 100 squared sandstone fragment, apparently used as a whetstone. Information from National Museums of Scotland typescript continuation catalogue per Mr T Cowie (NMS), 6 February 1998. 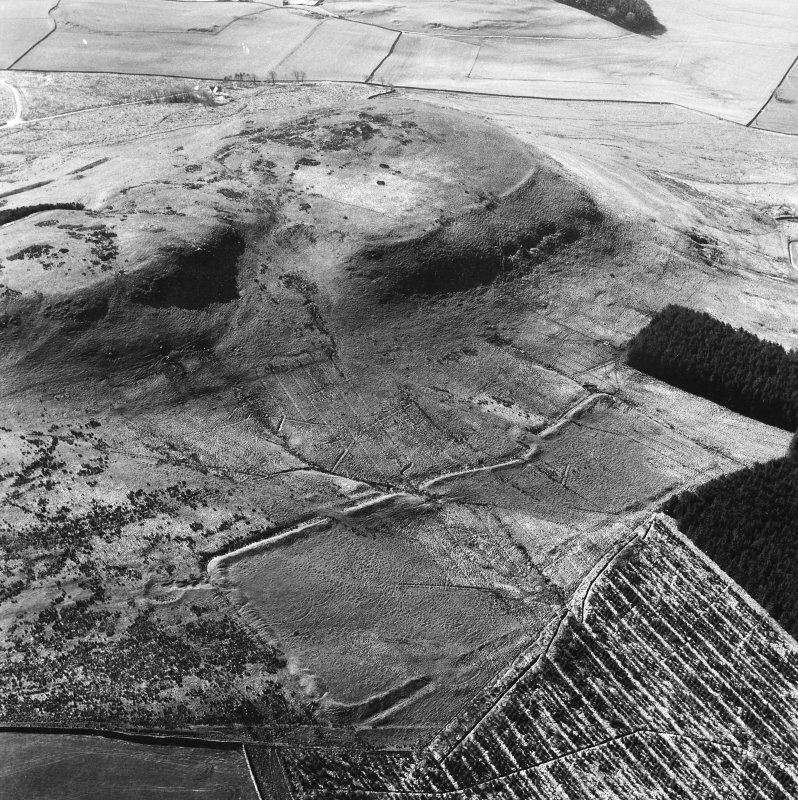 This great solid table of a hill, visible throughout lower Annandale, is the setting for the most extensive fortifIcation of any kind in the region. 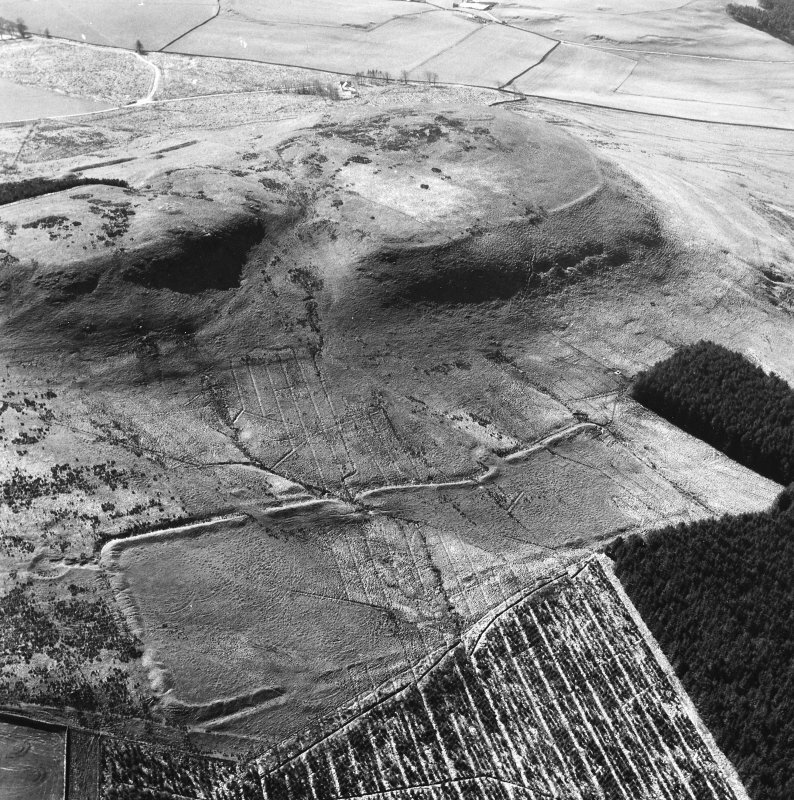 Surrounding its twin summits are the ramparts of-a native hillfort, covering an area of 7 ha and large enough to have been a major tribal centre. 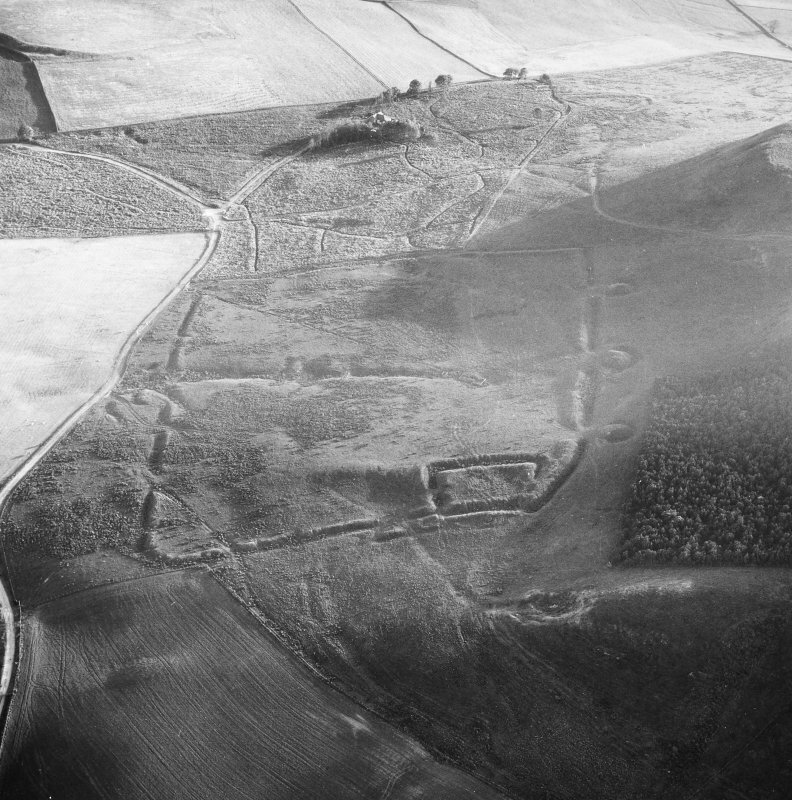 On its northern and southern flanks, carefully planted with an air of calculated menace, are two Roman camps; the larger, southern, camp has three salient artillery platforms, know locally as the 'Three Brethren', thrust purposefully up the hill towards the gateways of the hillfort a mere 120-135m away. Here the modem visitor can absorb the atmosphere of what looks like an ancient siegework, measure the likely range of the artillery, and gain further insight into that most awesome of war-machines, the Roman military mind. 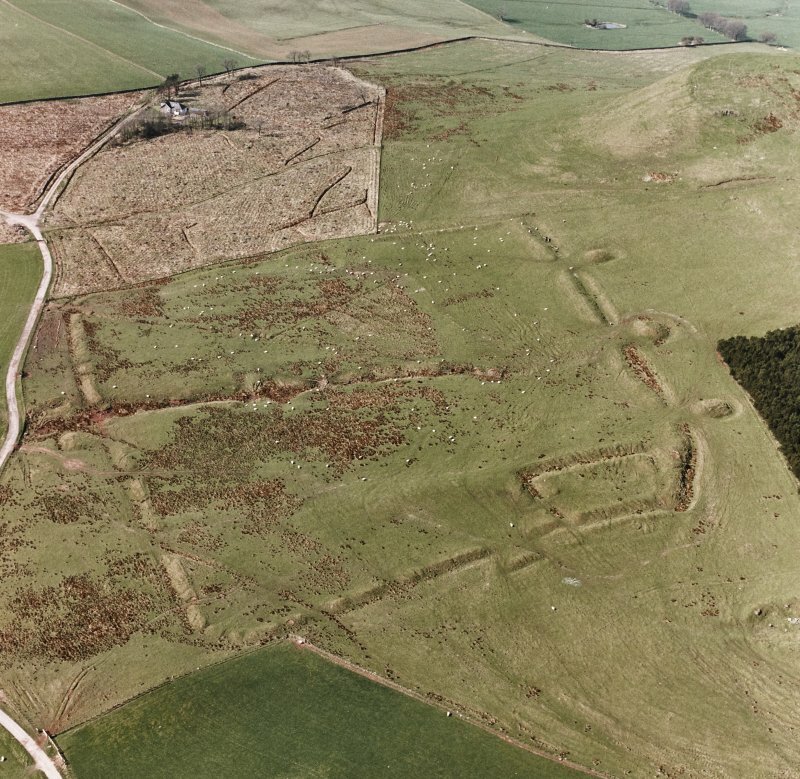 However, there is no known historical context for such a siege, and these remains probably reflect, not a close encounter between Roman and native, but practice camps for the Roman army in training. 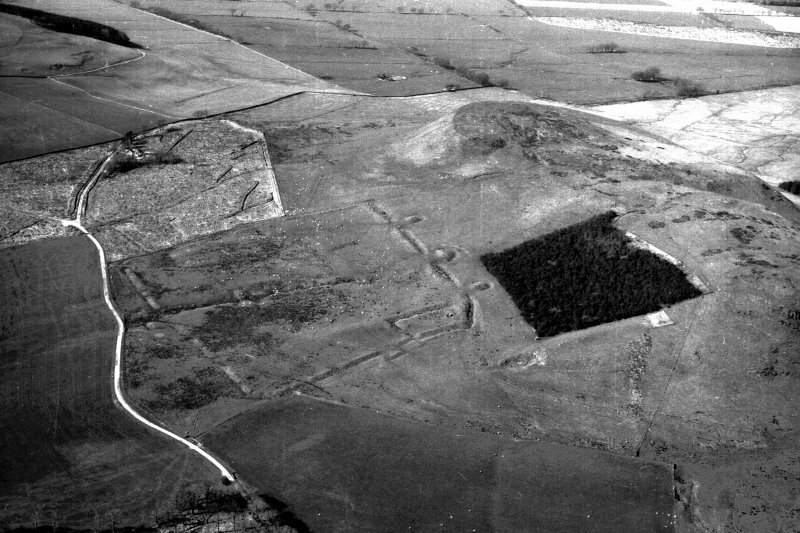 Recent excavations have shown that the hillfort defences were not upstanding when lead sling-bolts and stone ballistae balls were being hurled at them; the inference is that Roman troops were using a disused native fort for target practice, leaving the last practice rounds of re-usable ammunition on the hillside for archaeologists to gather up. However, it is not unknown, even within recent times, for such a stageset for field exercises to grow out of at least one phase of genuine military activity. 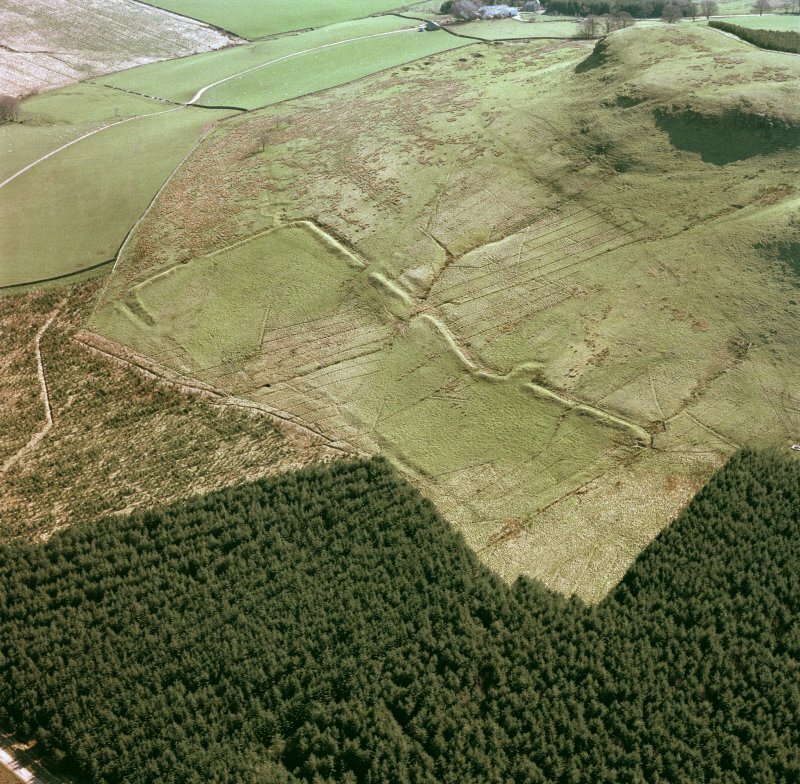 The main rampart of the hillfort double on the south east, single on the north, survives in discontinuous stretches oflow earthen. 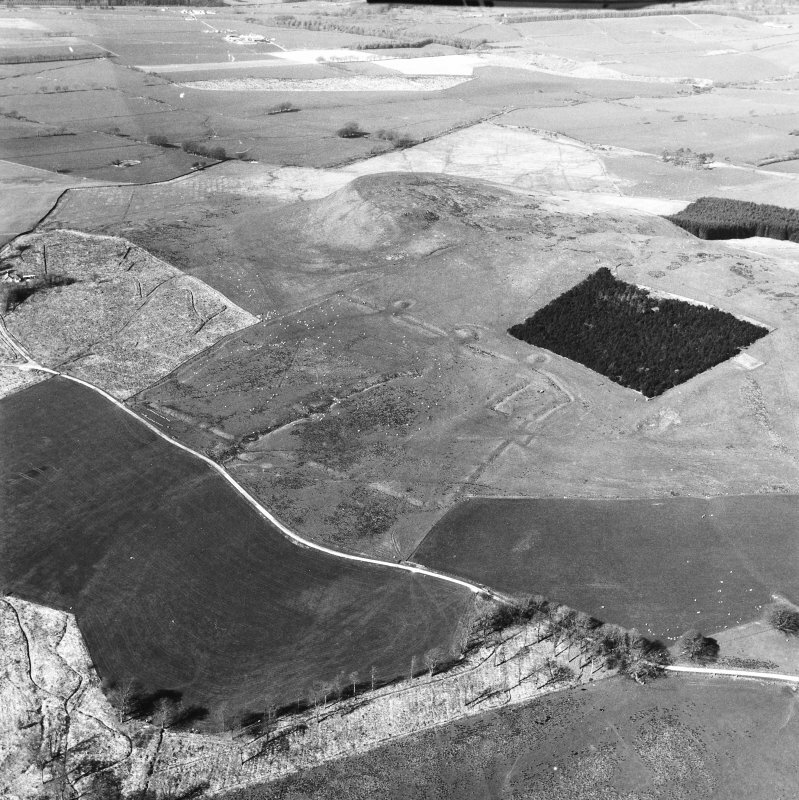 mounds and terraces. 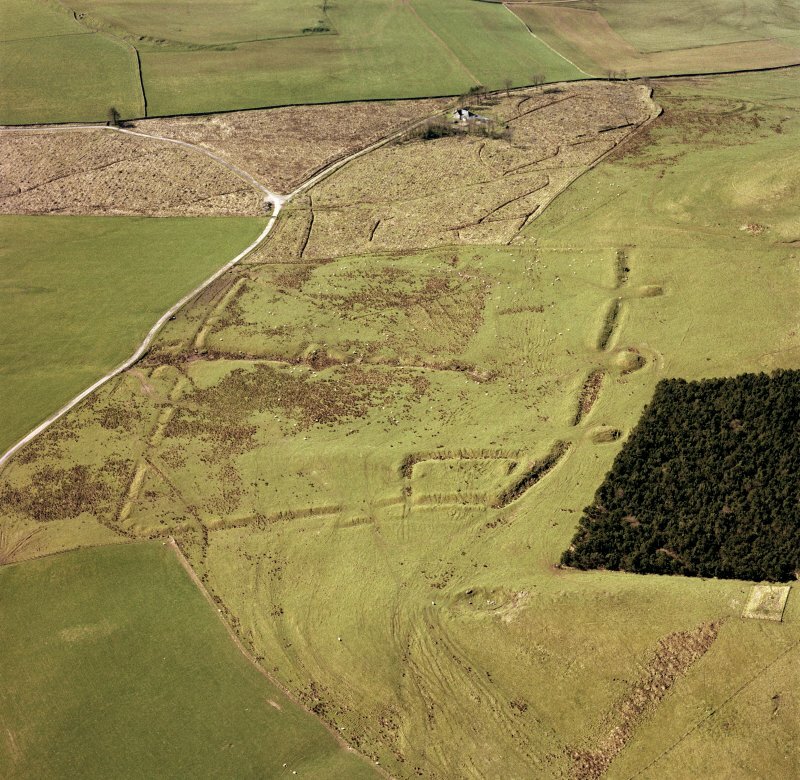 Excavation showed that it dated from around 600 BC, and had a fighting platform set on a double row of timber uprights protected by a stone-built outer face. The three known gateways are in the south-eastern flank. 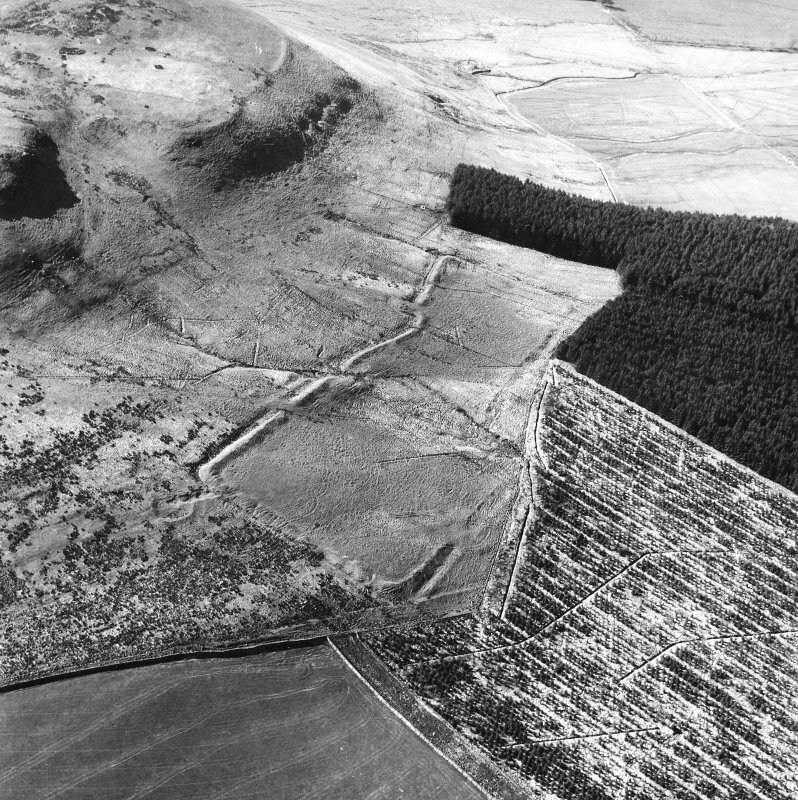 Excavation just above the eastern gate on the edge of the forestry plantation revealed part of the trench of a palisade line which antedates the hillfort. 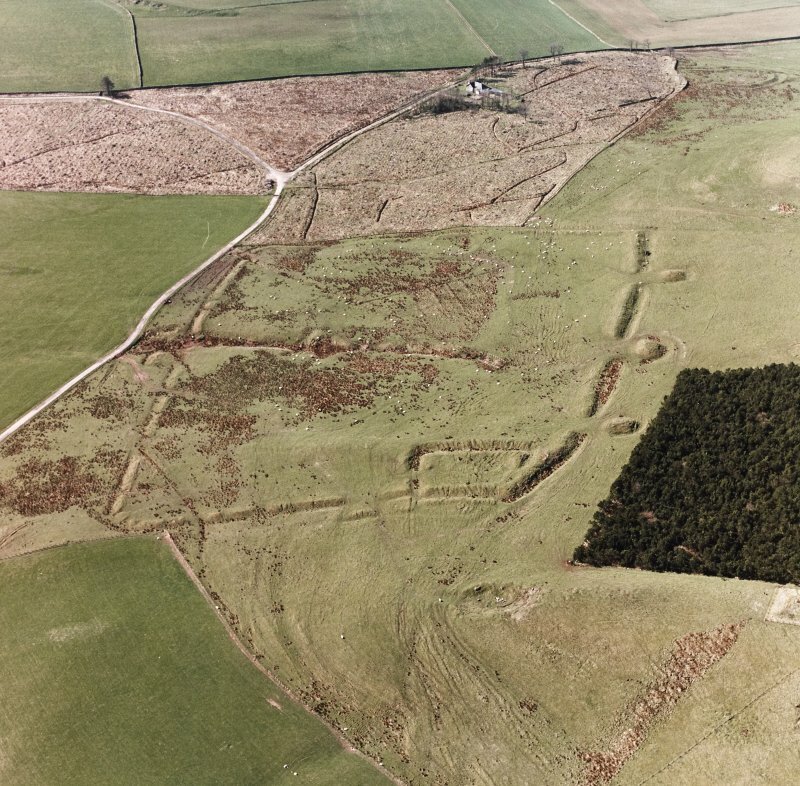 One part of the interior revealed a succession of four timber-built round houses, and hints of native occupation in the late 1st-2nd centuries AD. 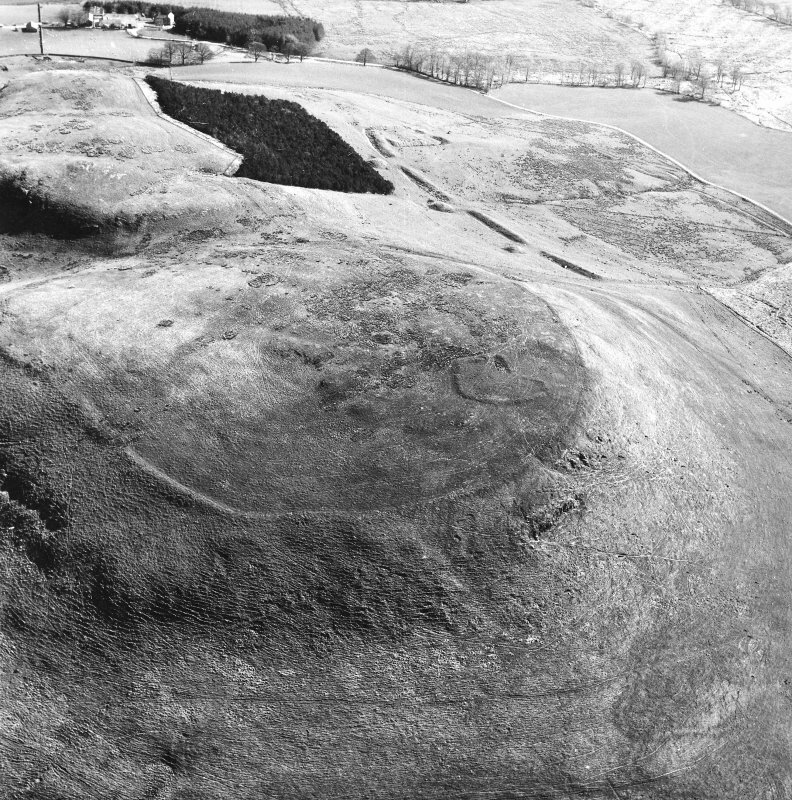 Other houses are indicated by hilltop hollows and scoops,and it has been estimated that the habitable areas could have contained at least 150 houses at anyone time. 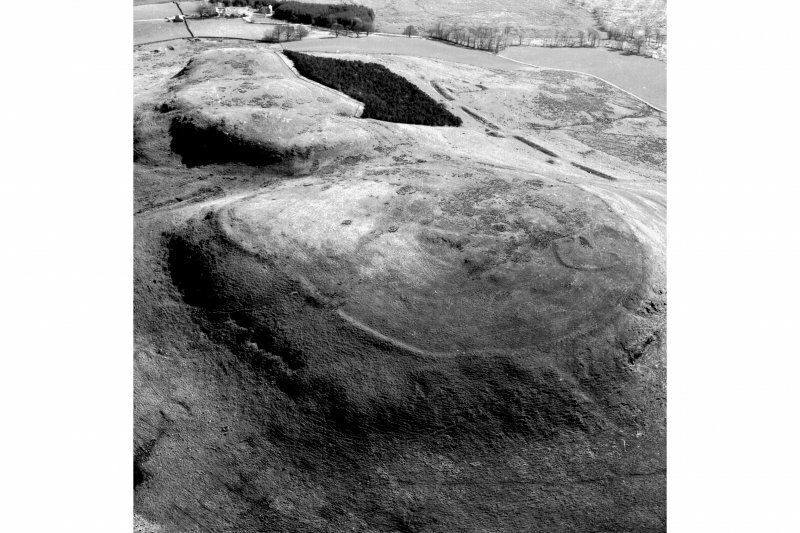 The earliest identifIable use of the hilltop is marked by a bronze-age cairn and cist burial situated near the centre of the plateau and towards the northeastern flank. 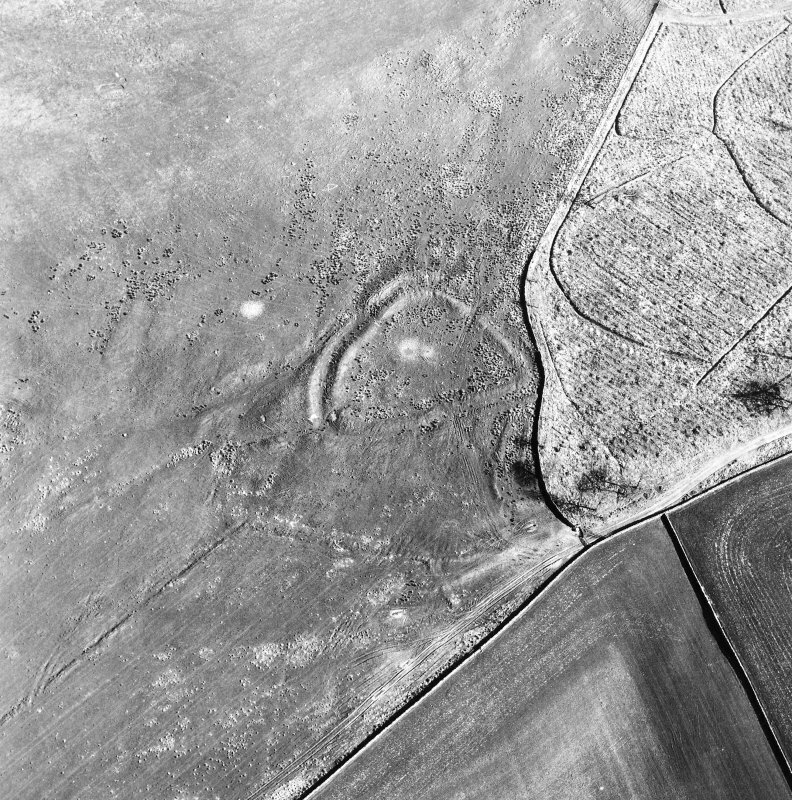 Late use is testifIed by an artillery redoubt at the south-western endi it probably dates from the mid 17th century and was re-used as a mapping survey station in 1847. 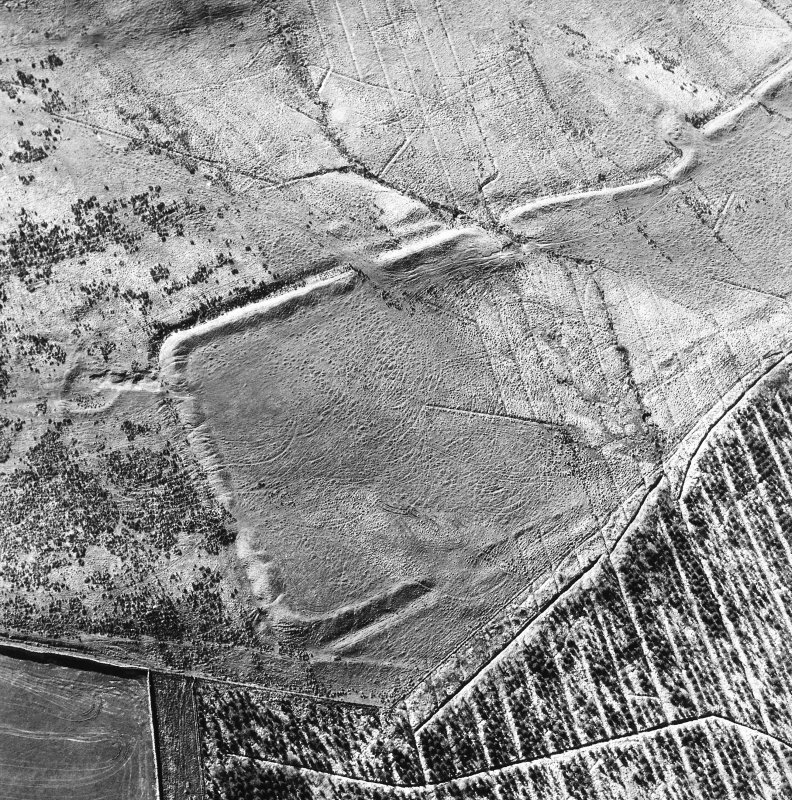 For Roman work, the North Camp is comparatively irregular. It is oflinear form, measuring about 305m in overall length and still preserving much of its rampart and ditch. 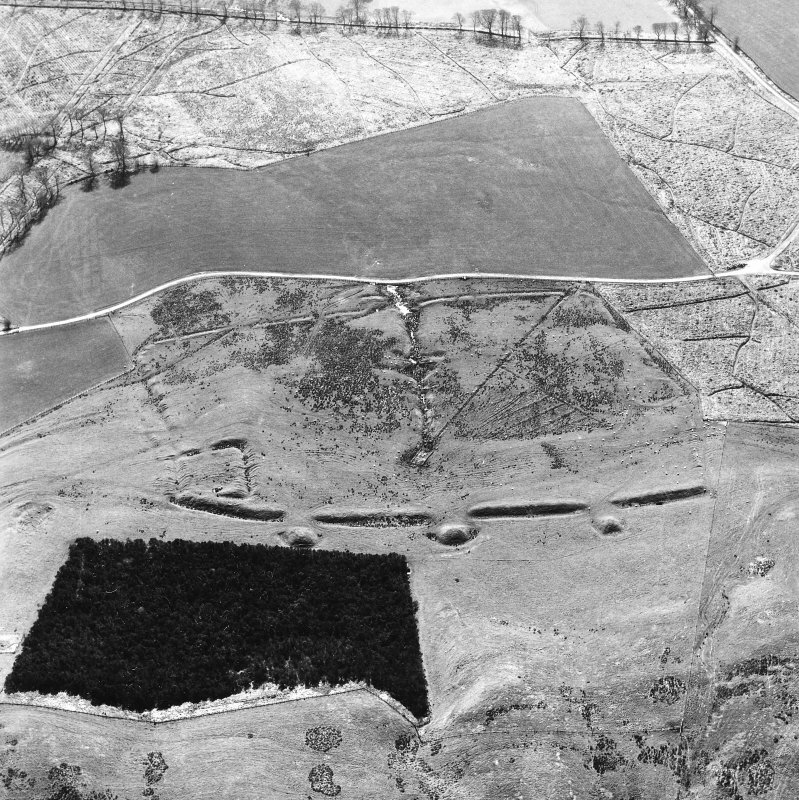 An outward turn of the rampart protects the gate nearest to the hillfort. 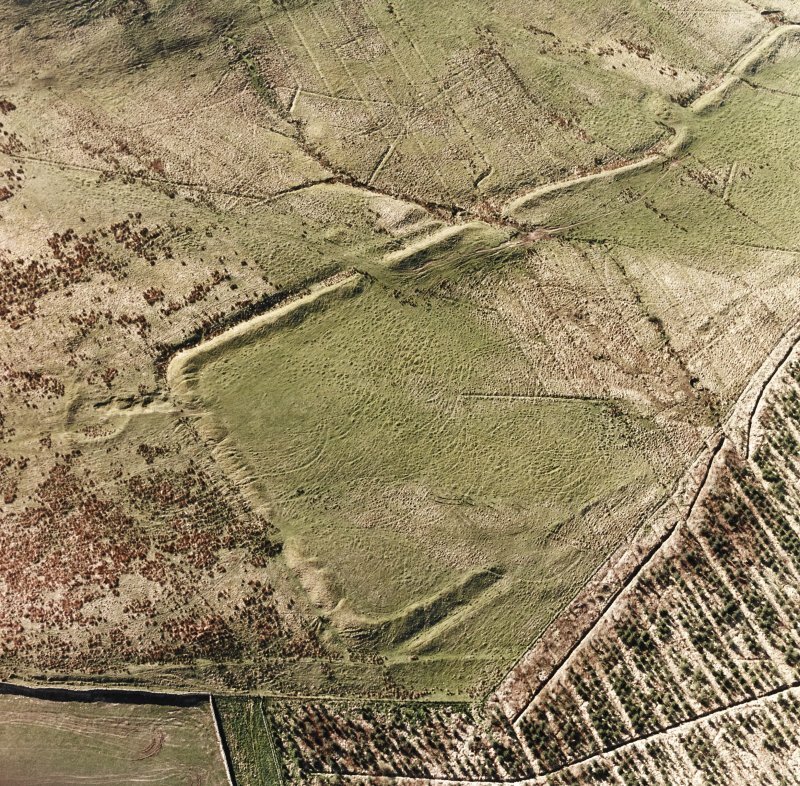 The South Camp is a large oblong enclosure some 4.5 ha in area, and its rampart and ditch achieve a substantial overall breadth of 17.7m on the uphill side. All entrances have been protected by outer mounds of stone-pitched construction, the larger 'Three Brethren' also serving as platforms for ballistae or spring-guns. 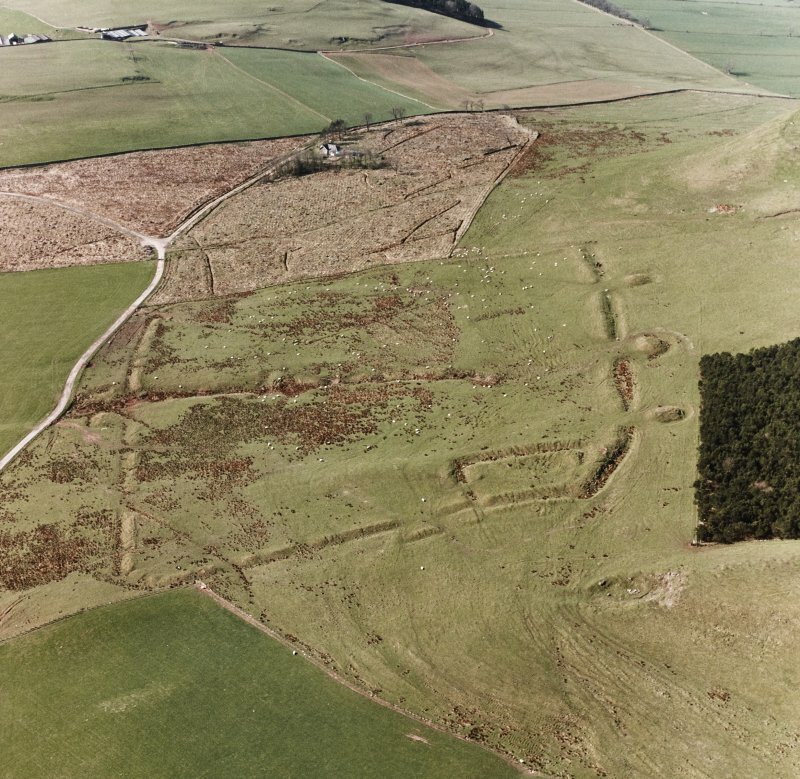 Embraced within the north-east corner of the camp's defences is a fortlet which can probably be ascribed to the Antonine period about AD 140. 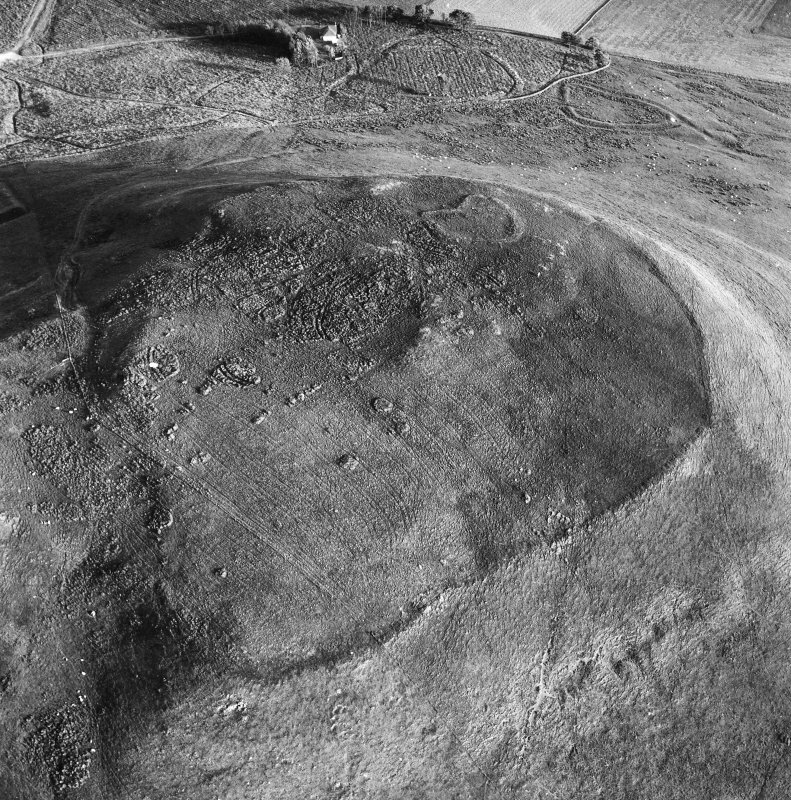 Excavations have not provided a date for the practice camps themselves, although the most obvious source of personnel was Birrens (no. 48) which remained in commission as a garrison-post until the AD 180s. There is no convincing proof of a continuous defensive line around the lower slopes of the hill. 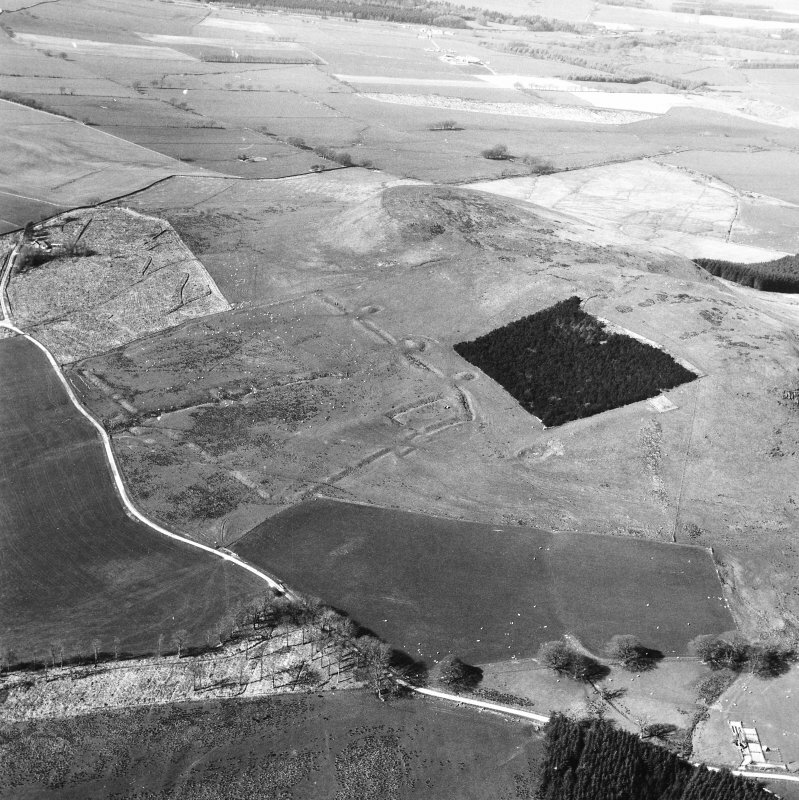 The earthwork enclosures east and south west of the hill are almost certainly native iron-age settlements, having no apparent defensive or offensive association with the hillfort itself. 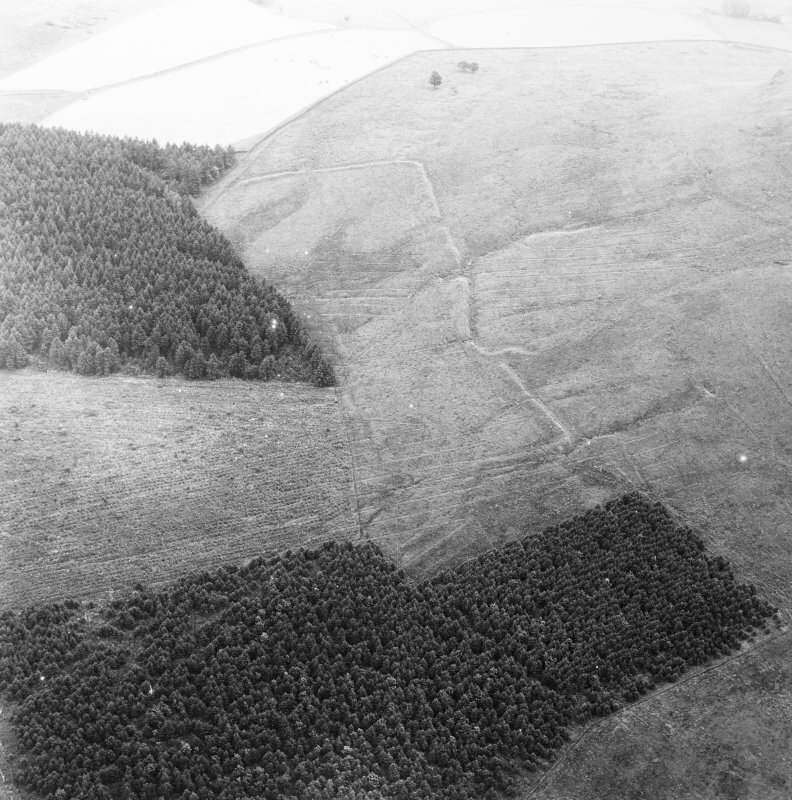 NY 1860 7870 A magnetic survey, undertaken in June–July 2008 and covering an area of 3.2ha, mostly within the S camp, revealed several features associated with the camp’s defences and interior. 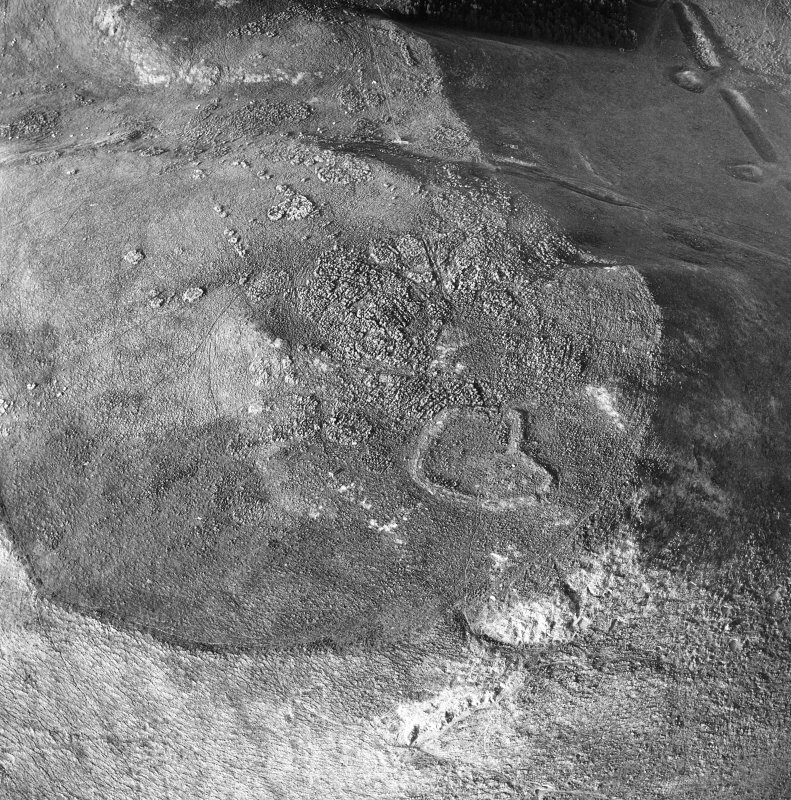 A similar survey was carried out in the vicinity of the enclosure 250m SW of this camp. NY 186 787 A watching brief and metal detector survey were carried out on 26 June and 3 September 2013 on the scheduled ancient monument of Burnswark, during construction work in the area. No finds or features of archaeological significance were recorded. From a distance, the appearance of the great flat-topped eminence of Burnswark Hill is striking. 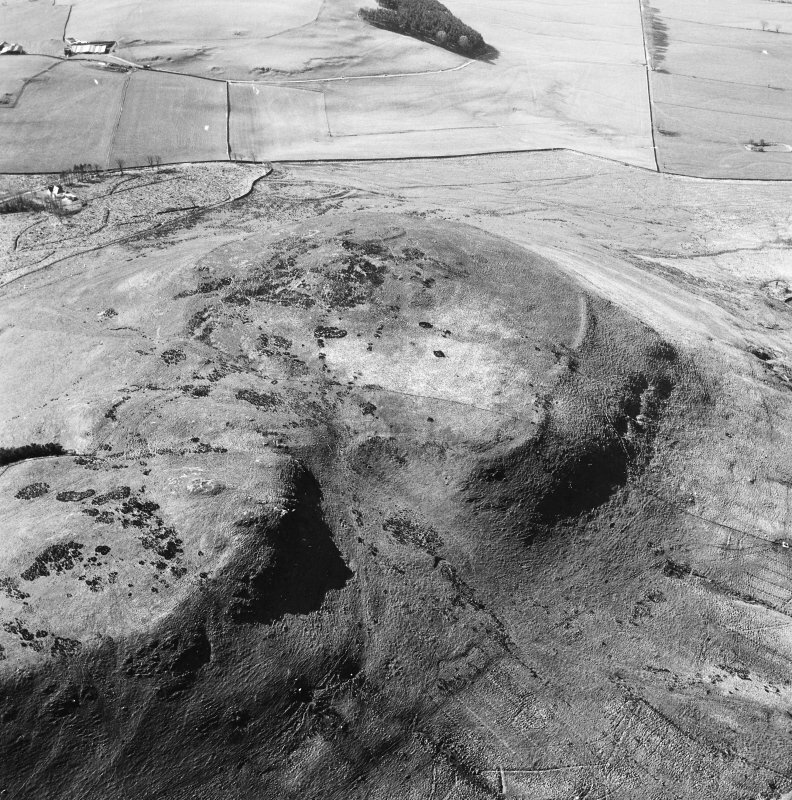 Lying approximately twenty miles north of the western end of Hadrian’s Wall and with its summit at almost 1000 ft it is easily seen from most of the Solway basin. The upstanding archaeological complex is even more impressive, consisting of a seventeen acre (6.88ha.) 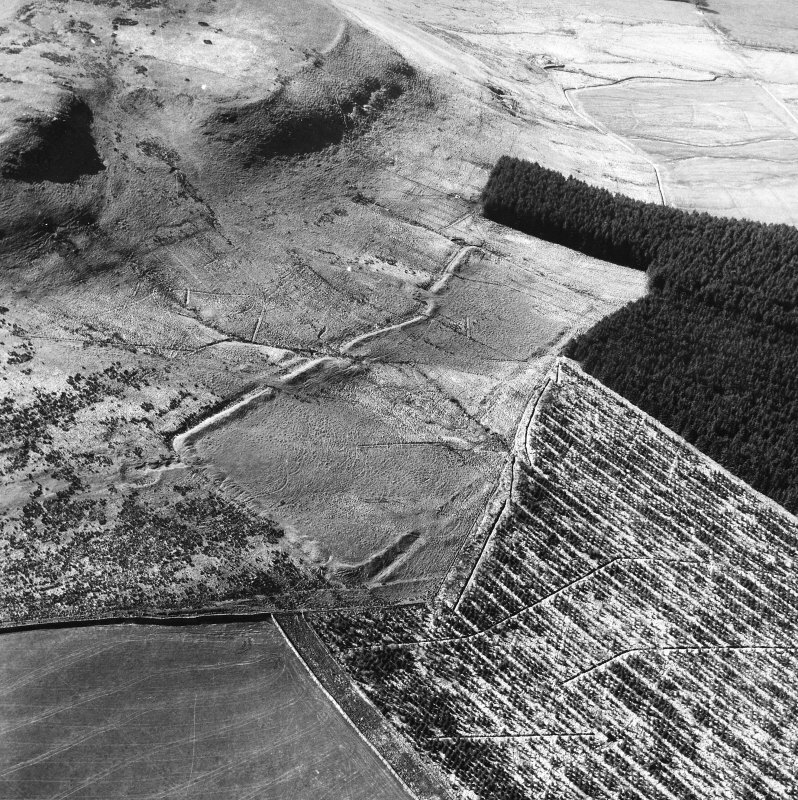 late prehistoric fort, the largest hillfort in Dumfriesshire, locked in the grip of two highly unusual Roman camps: a 12 acre (4.86ha) sub-rectangular structure to the south and an extraordinarily elongated 6 acre (2.43ha) camp to the north. 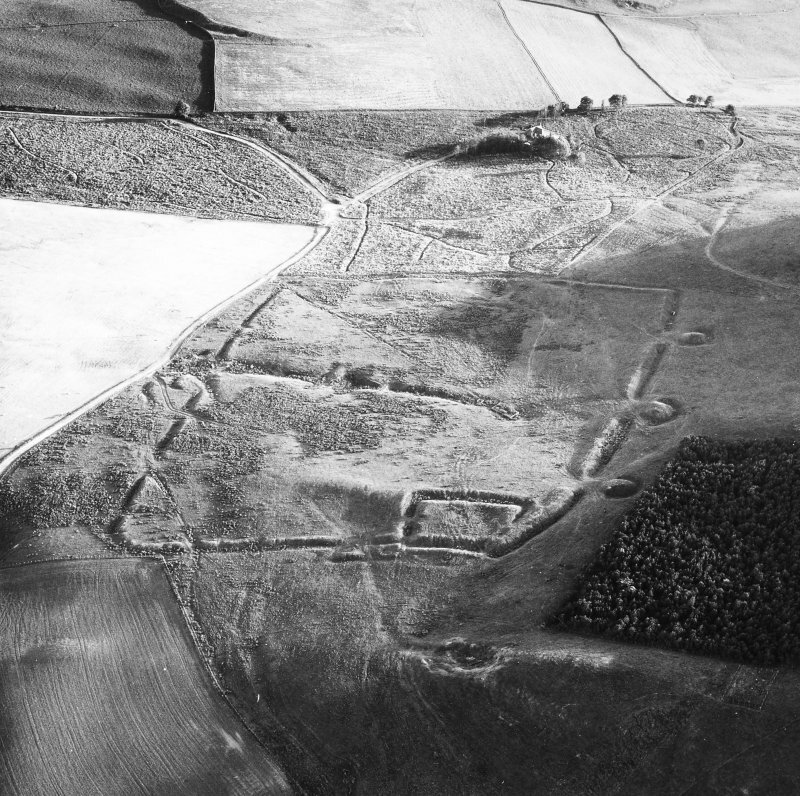 In the landscape around the site there is a rich backdrop of enclosed settlements, Bronze Age cairns, as well as Roman roads, and later medieval and post-medieval farms and farming activities. 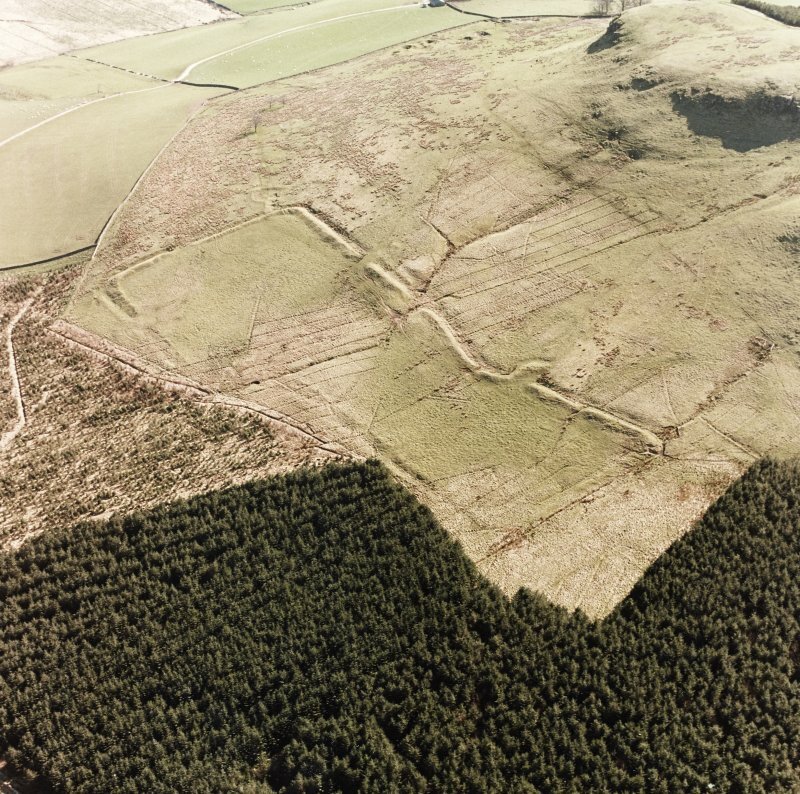 From the air, the south Roman camp and associated features such as the fortlet, and the three supposed ballista platforms, and the other Roman camp to the north, one imagines an undocumented siege of the prehistoric fort. 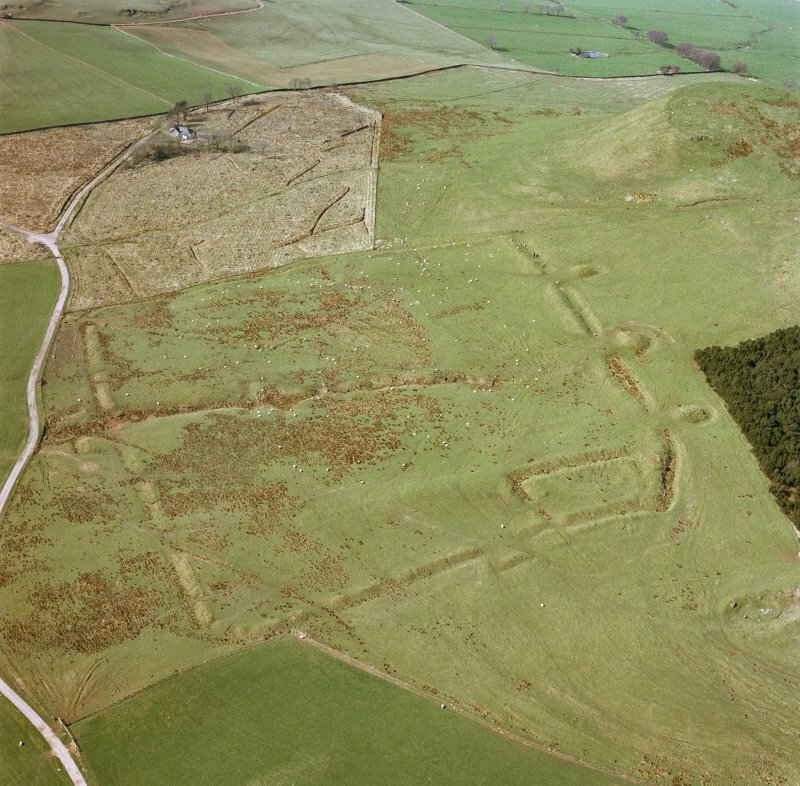 The arrangement of Roman camps and prehistoric forts, unique in Britain, is so distinctive that it has drawn the attention of antiquarians and archaeologists alike for at least the last three centuries. Previous commentators and excavators read like a list of the great and the good in Roman archaeology in Britain, including Roy, Haverfield, Schulten, Macdonald, Collingwood, Birley, St Joseph, Richmond, Jobey, Keppie and Breeze. There have been two previous notable digs, the first in 1898 by Barbour on behalf of the Society of Antiquaries of Scotland and the second in the 1960s by George Jobey. 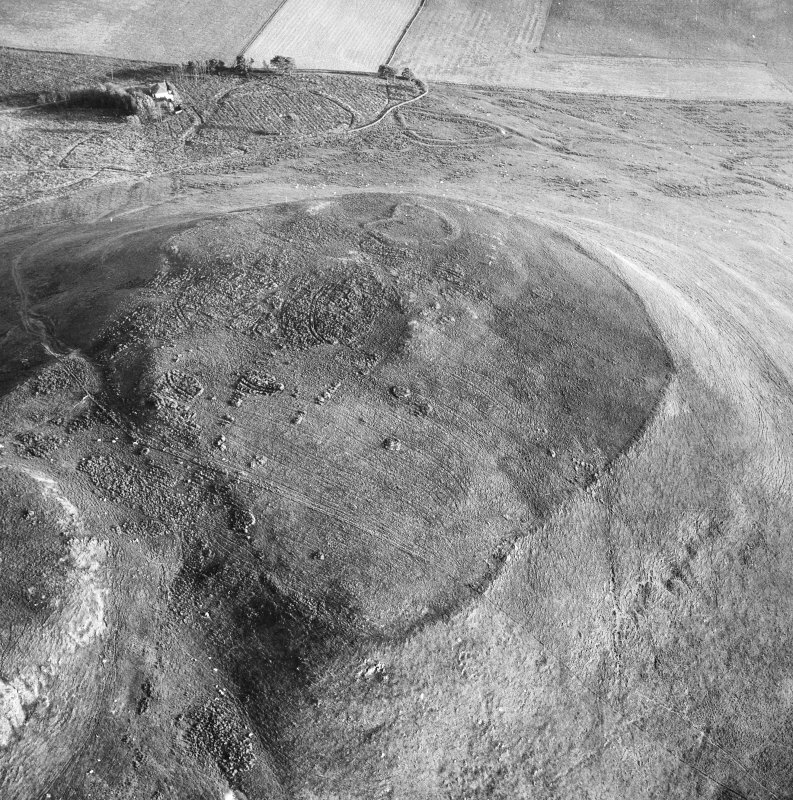 However, immediately prior to Jobey’s investigations in the 1960s there arose a speculative theory that seemed to counter the intuitive assessment of previous scholars who had identified the site as one of major conflict. 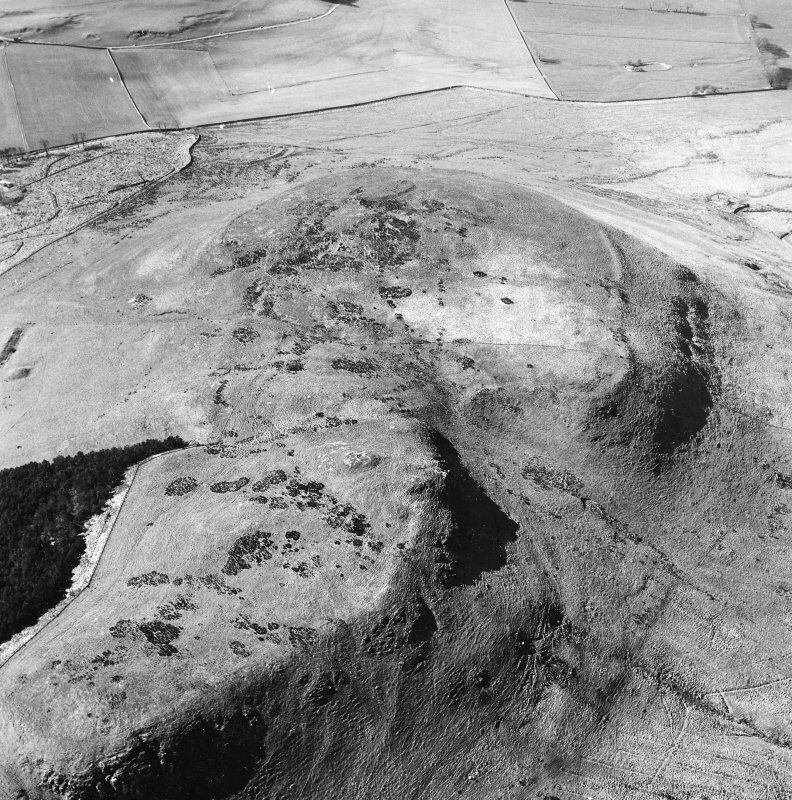 The originator of the new theory, Kenneth Steer, the then secretary to the Royal Commission for Ancient Monuments of Scotland, was no lightweight pundit. 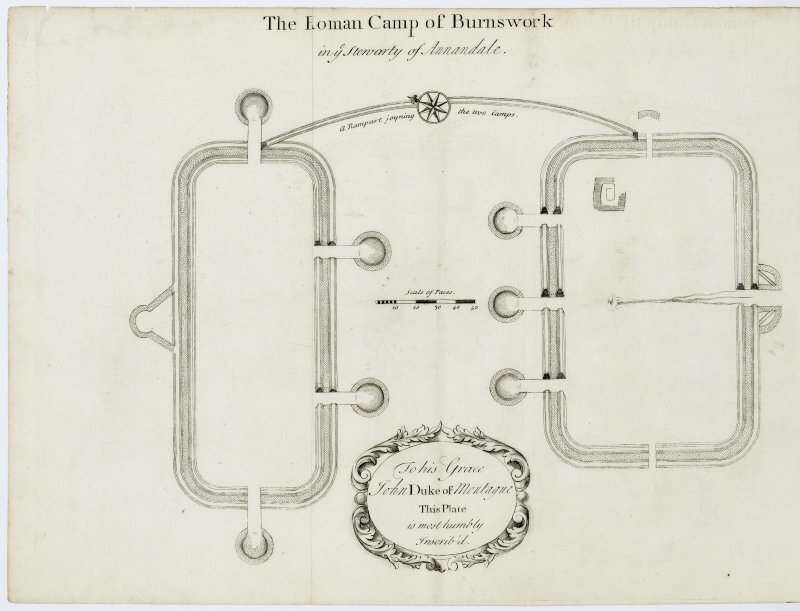 Recently returned from a role as a real-life ‘Monuments Man’ in the British Army, he postulated that the camps were a training facility; in essence an elaborate firing range for Roman troops to practice their artillery and other ballistic weapons. 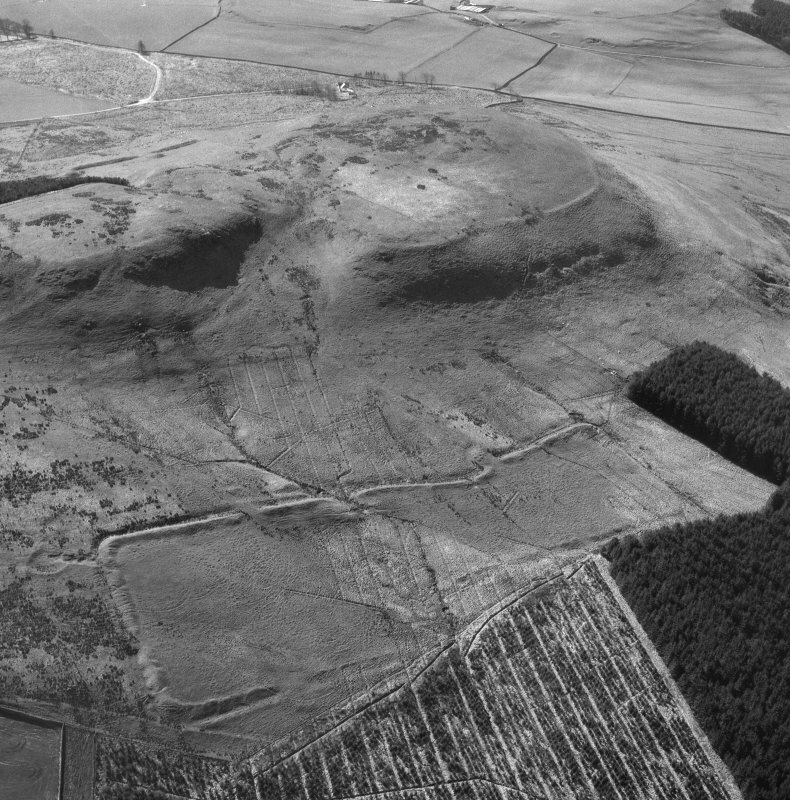 Steer’s desire perhaps to confirm the reported rigour of Roman army training, saw this as an explanation for the profusion of in-situ missiles on the site (lead sling bullets, iron arrowheads and stone ballista balls) and the apparently slighted nature of the hillfort’s rampart. 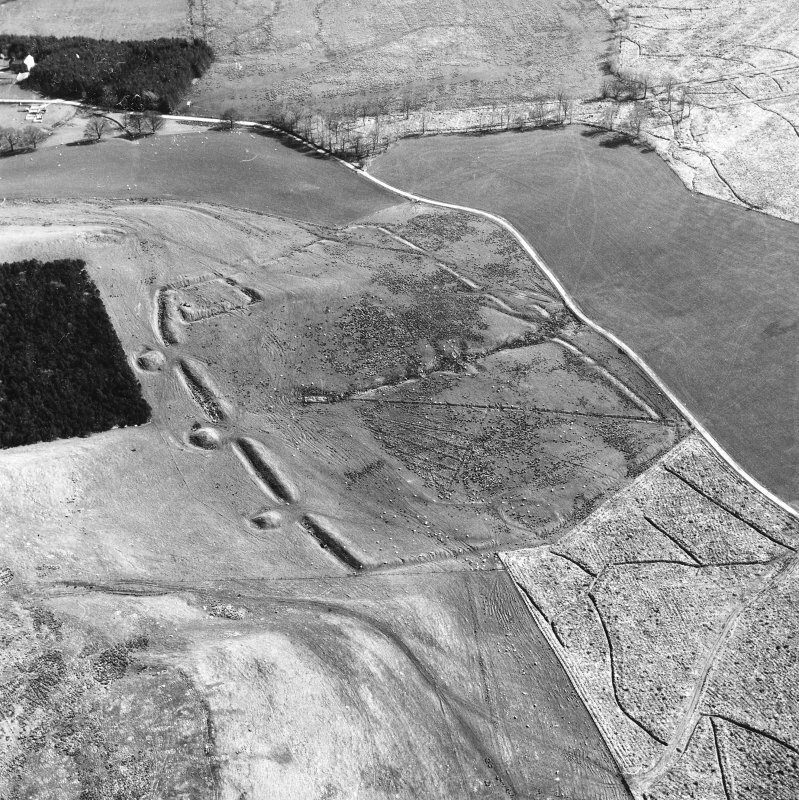 Jobey’s excavations of the hillfort defences appeared to support Steer’s theory by identifying numbers of leaden slingshot within the gateways, the suggested position of temporary Roman ‘targets’. This theory gathered momentum particularly with those who saw the Romans as the only significant force in the area (obviating the need for conflict) and it consequently entered popular literature as fact. However, Steer’s suggestion has not gone completely unchallenged. Three more recent observers, Keppie, Campbell and Hodgson, have subsequently reinterpreted the site as one of an actual conflict. The data from previous invasive investigations however has been sufficiently limited and ambiguous for it to be read either way, so much so that a recent comprehensive review by David Breeze in 2011 has painted a finely balanced picture. 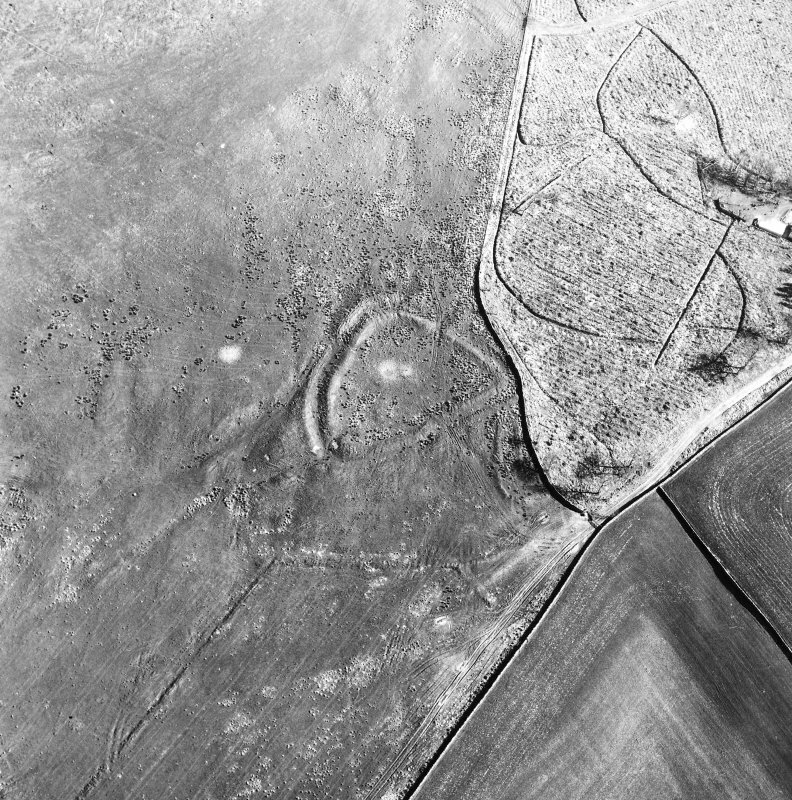 It was therefore decided to approach this enigma using more modern remote sensing and analytical technology unavailable to early investigators. 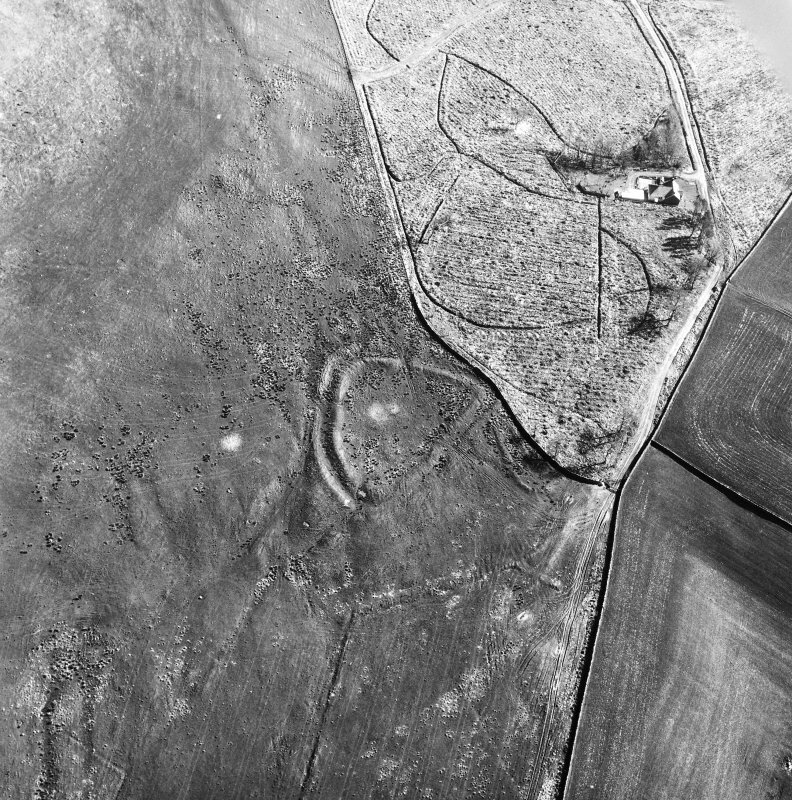 For the last three years, an HLF funded community archaeology project led by the Trimontium Trust has utilised aerial imaging, geophysics, high resolution metal detecting and highly selective excavation to add further data to the discussion. This fieldwork has been supplemented by an unprecedented lead isotope analysis of the lead sling bullets recovered from the site during the previous and current excavations to determine the contemporaneity of the ballistic events. Results have been encouraging and nearly two thousand metal ‘targets’ have been non-invasively plotted. Selective trenching has confirmed very high concordance between detector identification and confirmed lead sling bullet positions. 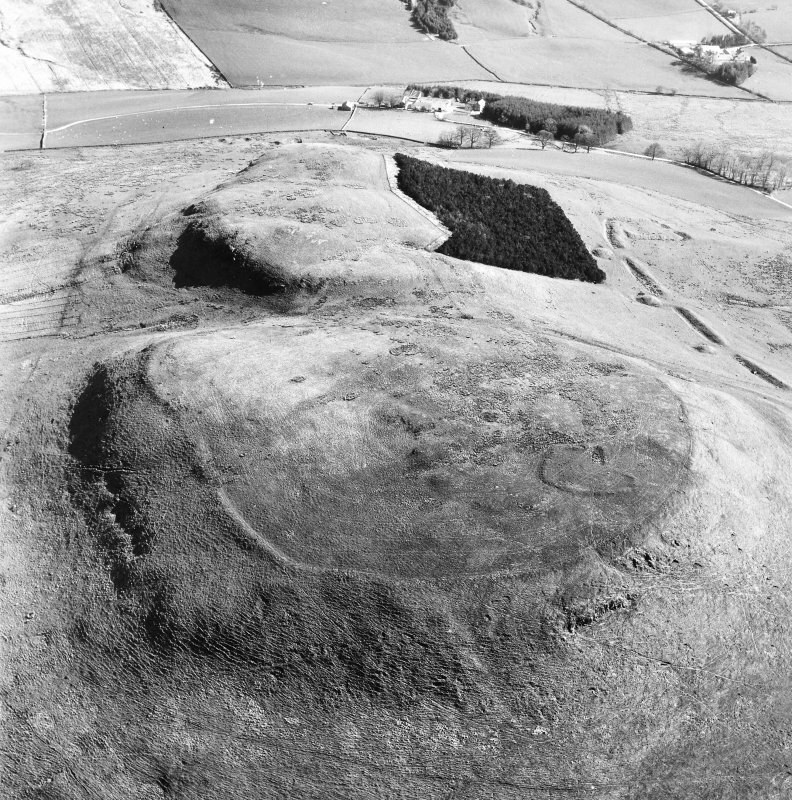 The overall impression is of a single massive missile storm (including sling bullets, stone ballista balls, conventional arrows and ballista bolts) across half a kilometre of the southern facing rampart of the hillfort. 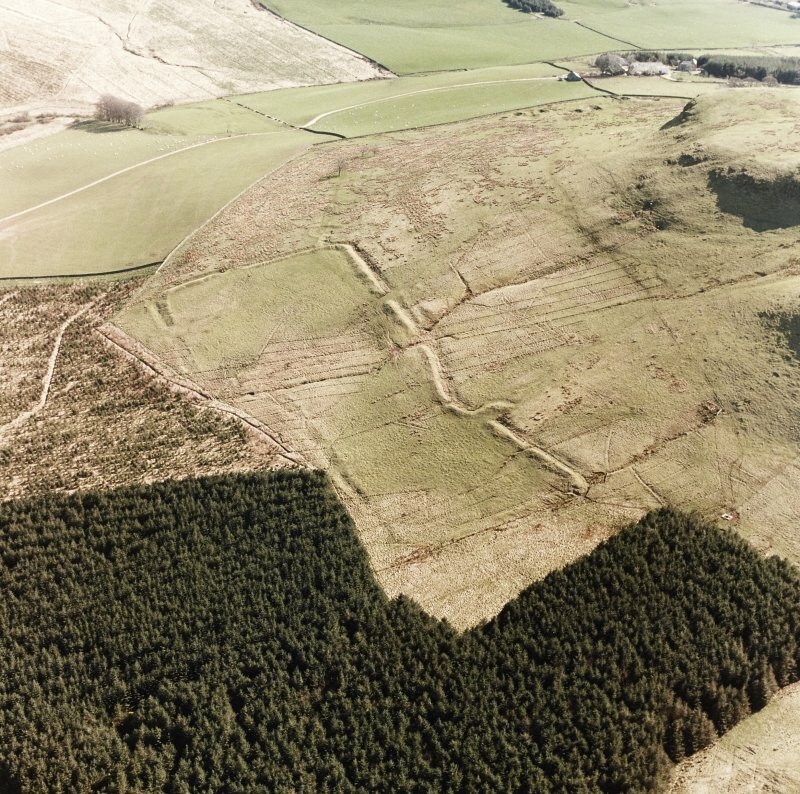 The profusion, and more particularly the ballistic distribution of Roman missiles detected by the 2015/16 metal detecting survey and the correlation of finds from the 2015/16 excavations suggest that there was indeed a major assault on the summit of Burnswark Hill. But in response to what and when? So far we can only speculate as to why an assault technique was employed by the Romans when facing insurgents on the continent (particularly in Judea), and why it was being used with such vigour in north Britain when it appears not to have been required anywhere in the south. Were the Southern tribes a walkover? 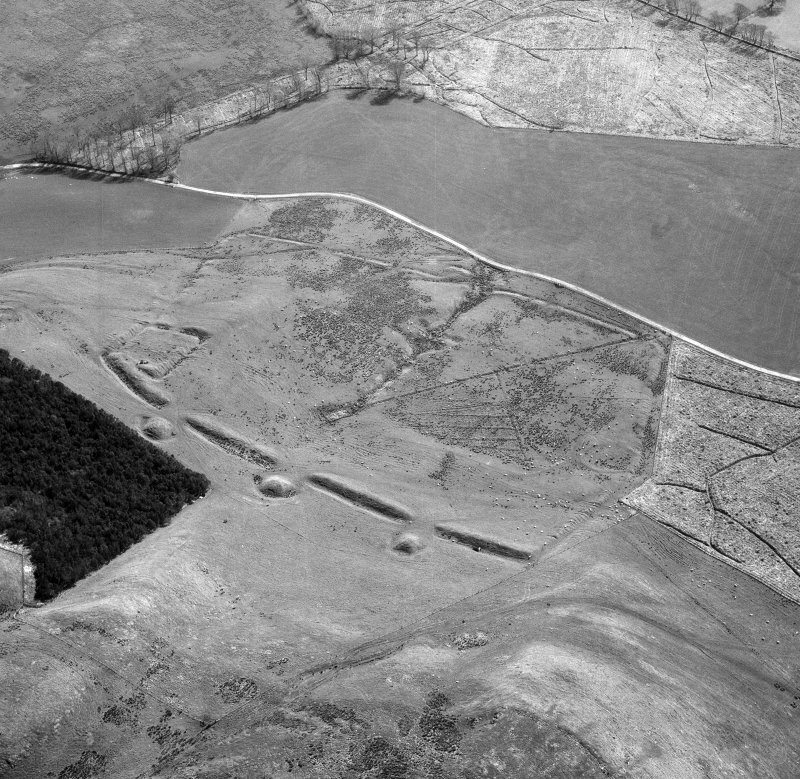 Was it a reprisal for some unrecorded attack on the nearby Wall in Hadrian’s reign, or was it a blooding of Roman troops prior to Antoninus’s major military incursion into Caledonia? Was it the modus operandi of an Imperial Governor recently returned from a posting to Judea? Only dating evidence from further fieldwork will help address the lacunae in this enigmatic period of the Roman occupation.